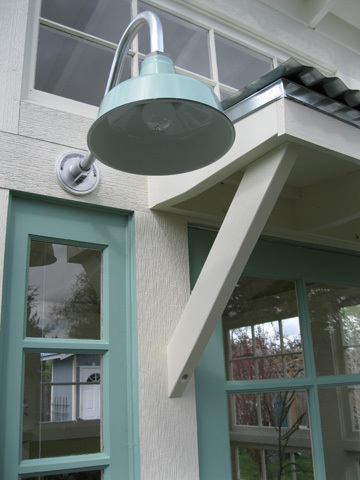 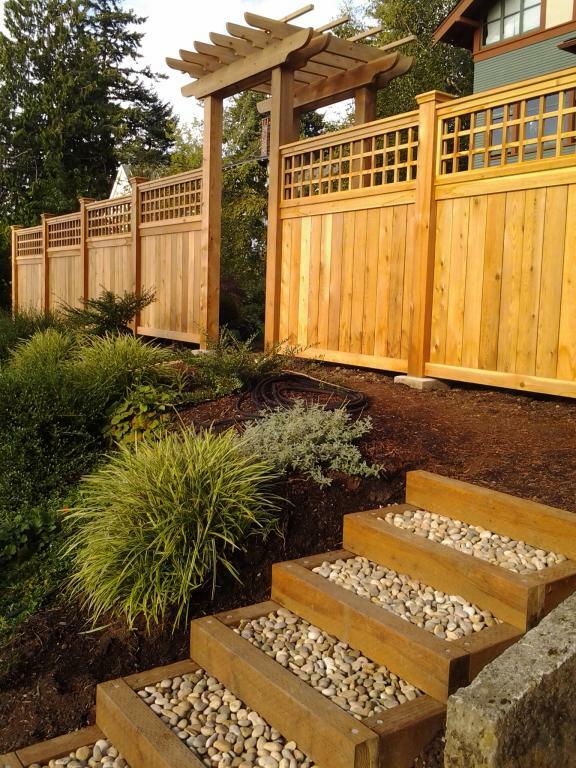 After adding a lot of landscaping and hardscaping to get their property into shape, our clients then hired us to create a striking main entryway to the house, as well as a more subtle screen for all things garbage and recycling. 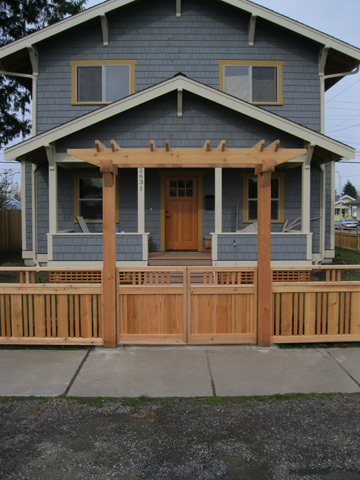 The main arbor and gates quietly echo some of the houses' details, while the screen/fence maintain a simple but stylish architectural appeal. 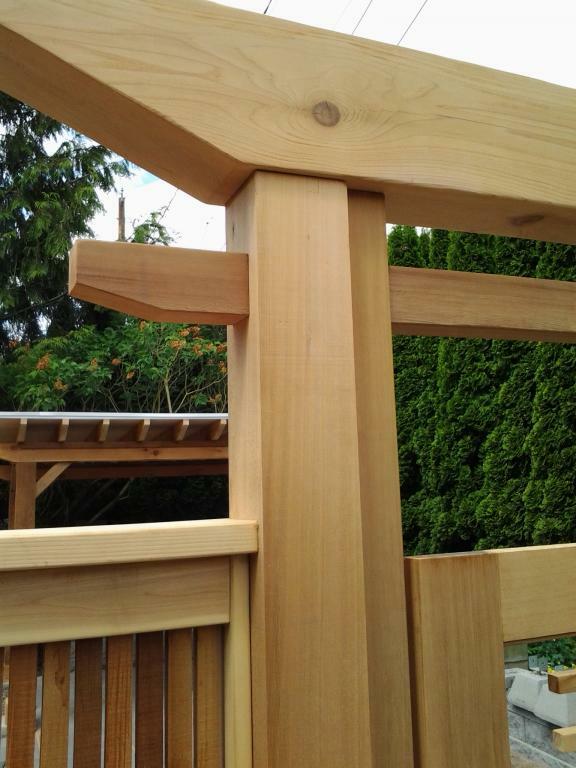 As always, it was a pleasure bouncing ideas back and forth with our client in order to achieve a great end result. 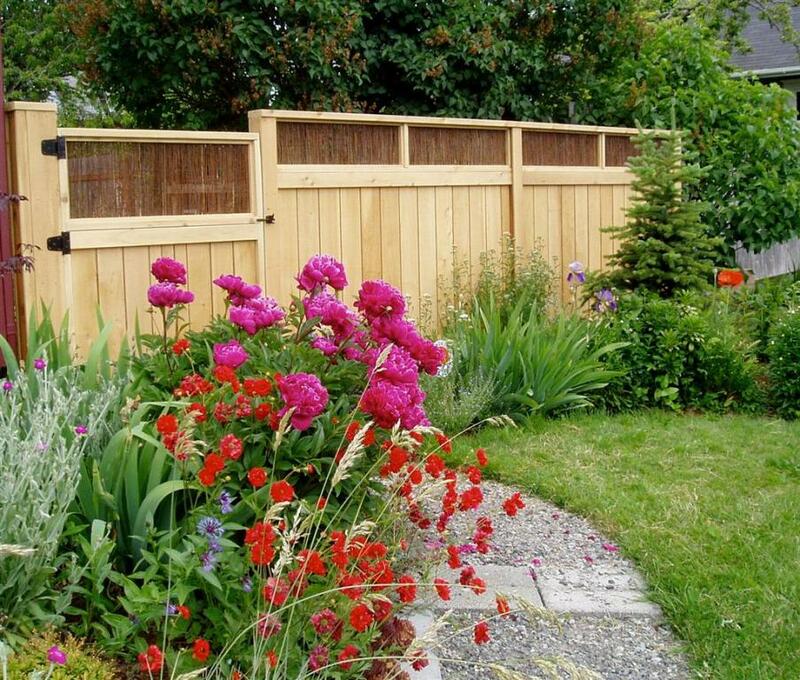 Keeping a garden from being an open buffet for deer can be challenging. 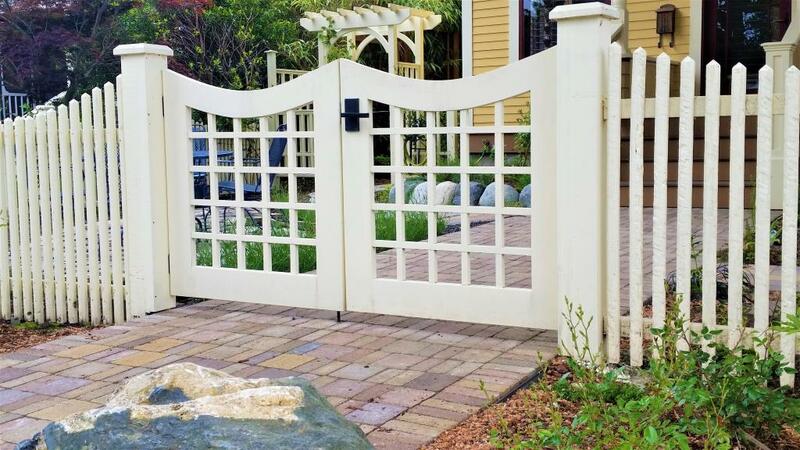 While there are several options for keeping them at bay, few add any architectural appeal to a property. 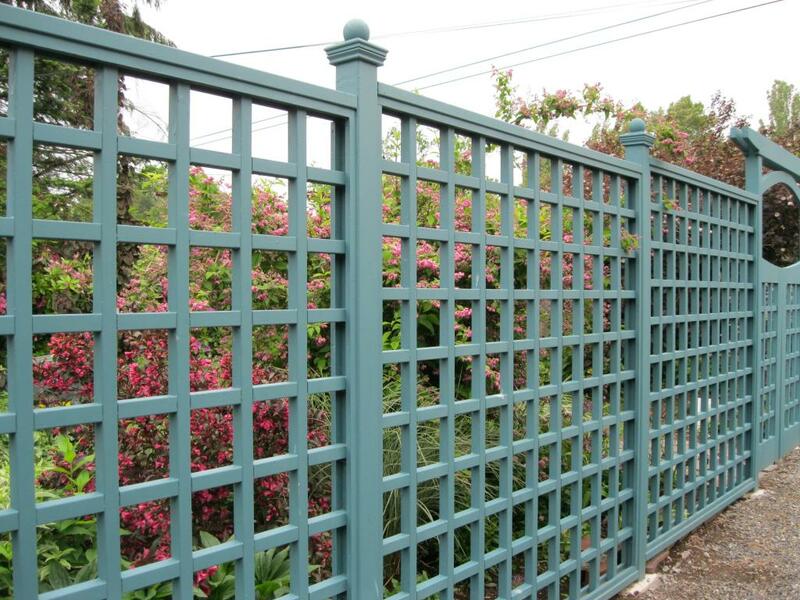 This sturdy lattice fence (constructed of fully joined 2 X 2s) is seven feet high, but doesn't dominate the scene due to its openess. 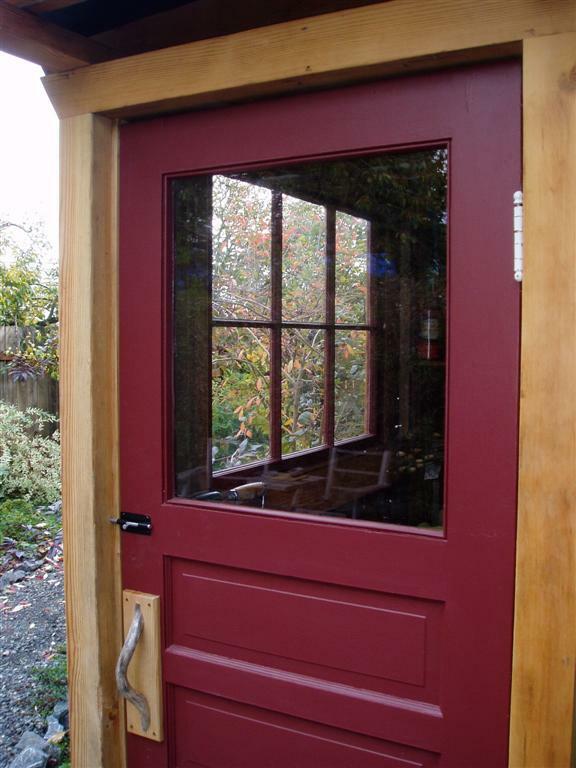 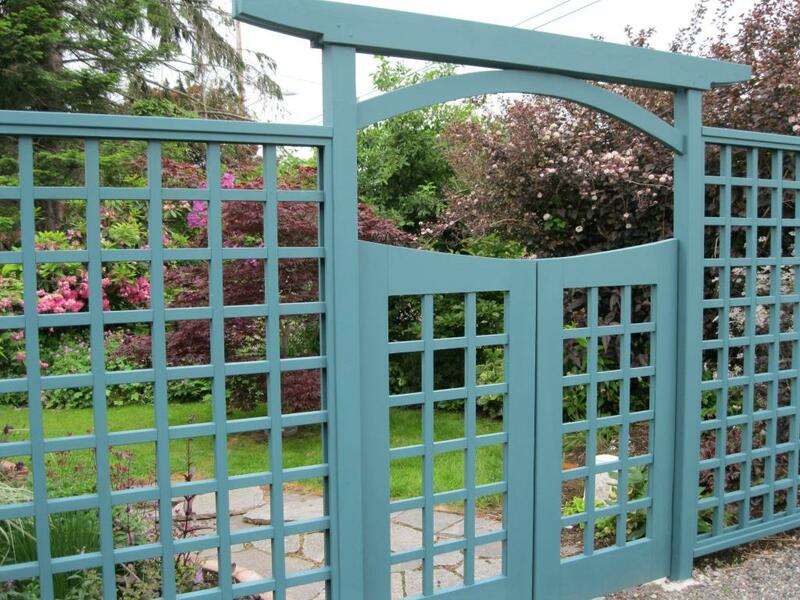 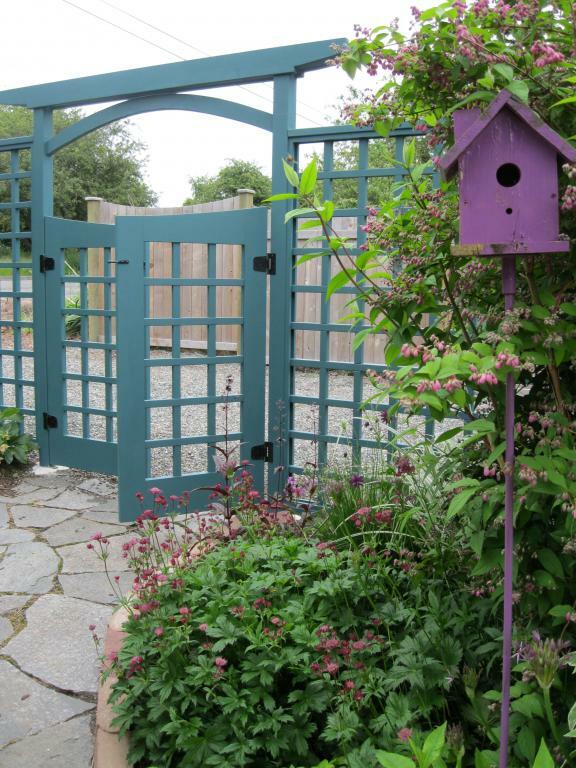 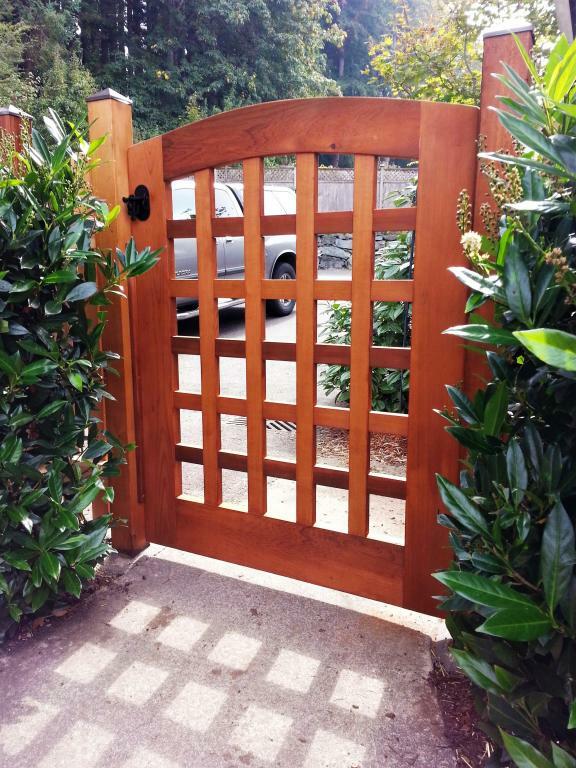 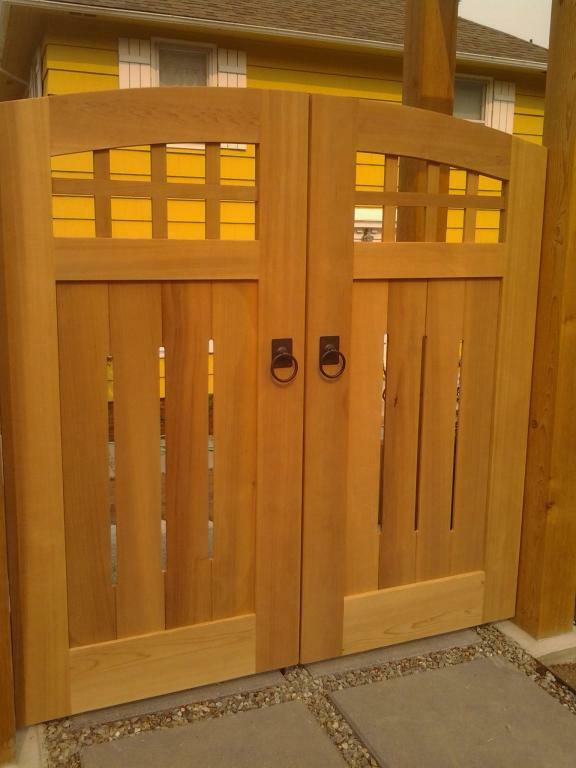 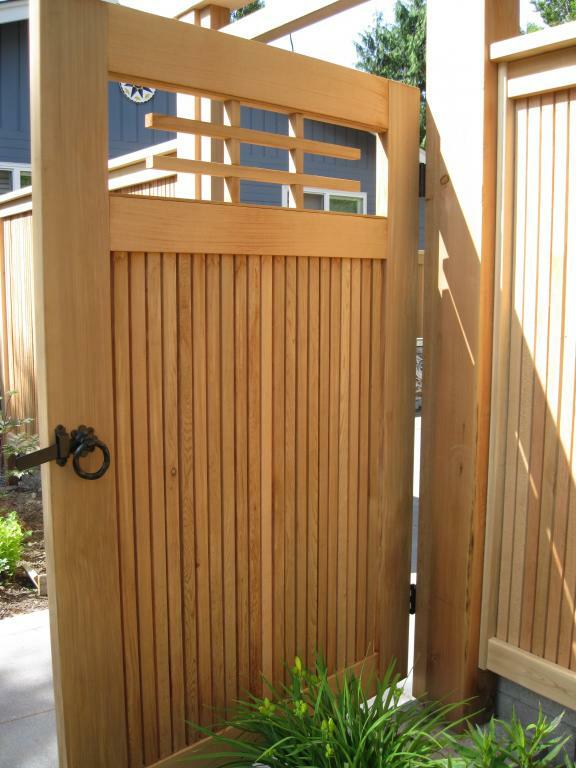 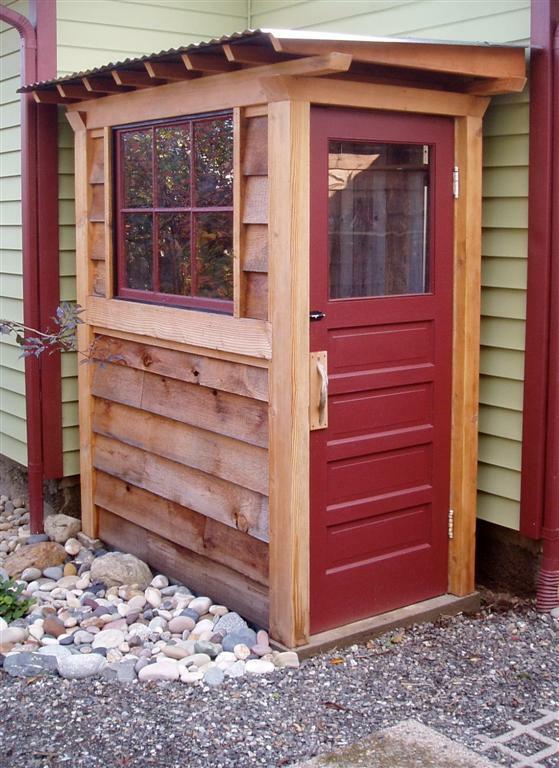 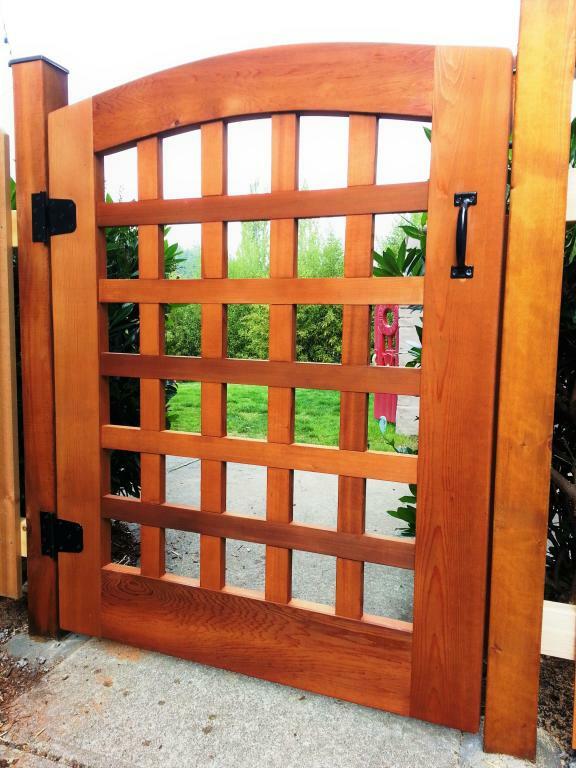 Gentle curves in the gates and arbor soften the linear feel of things and offer a welcoming entry point. 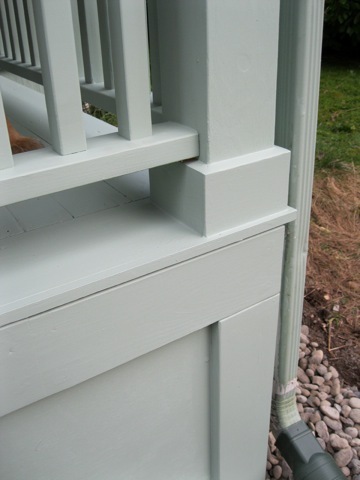 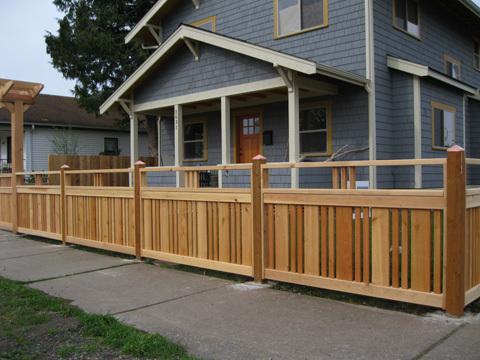 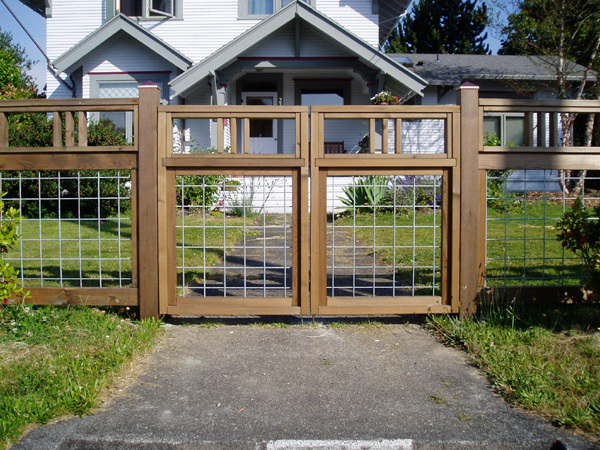 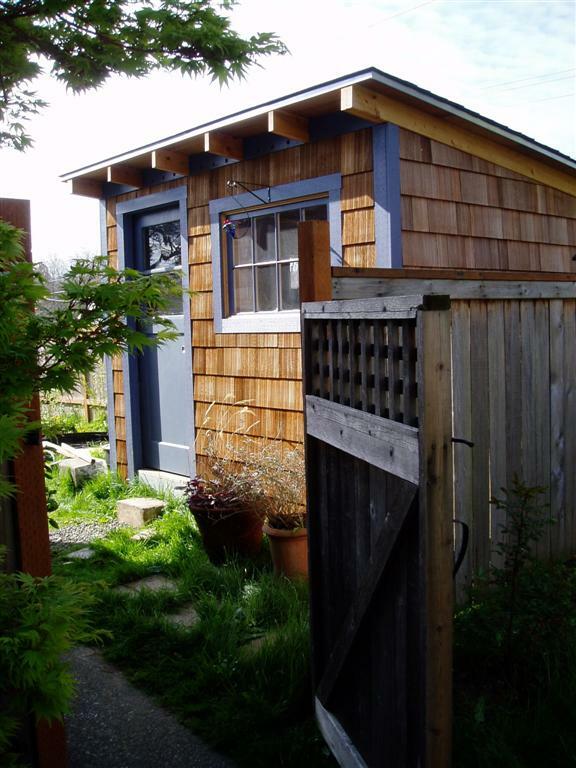 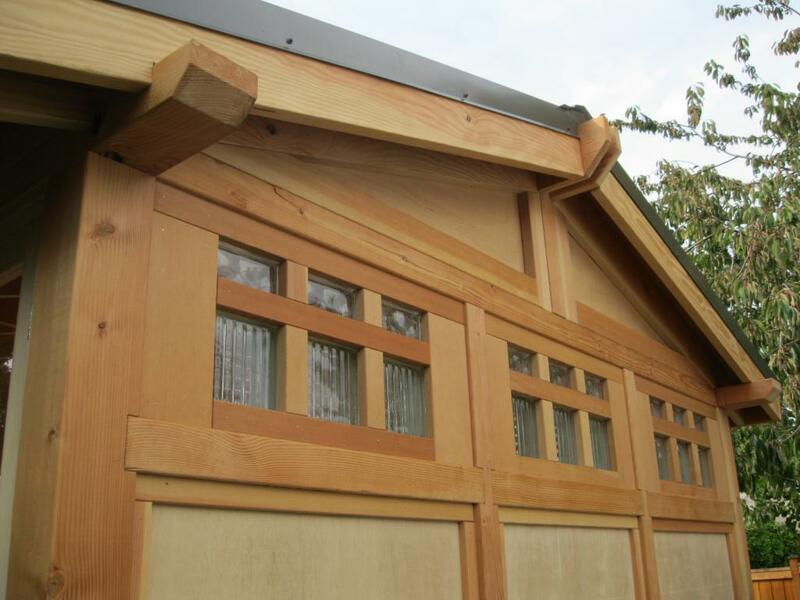 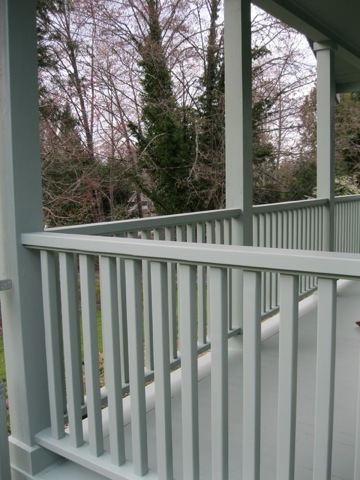 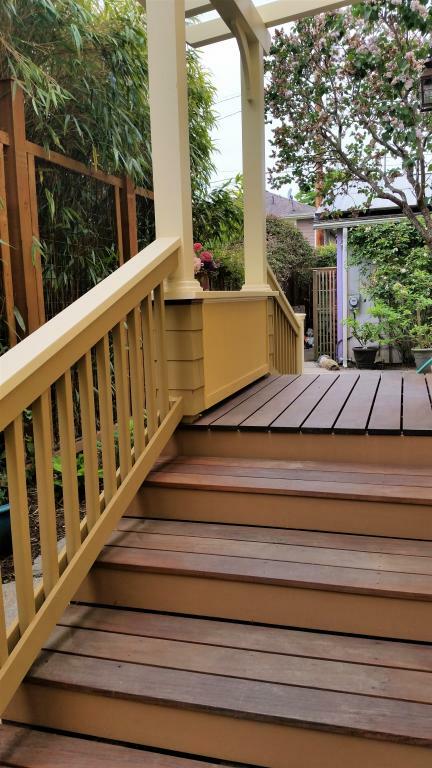 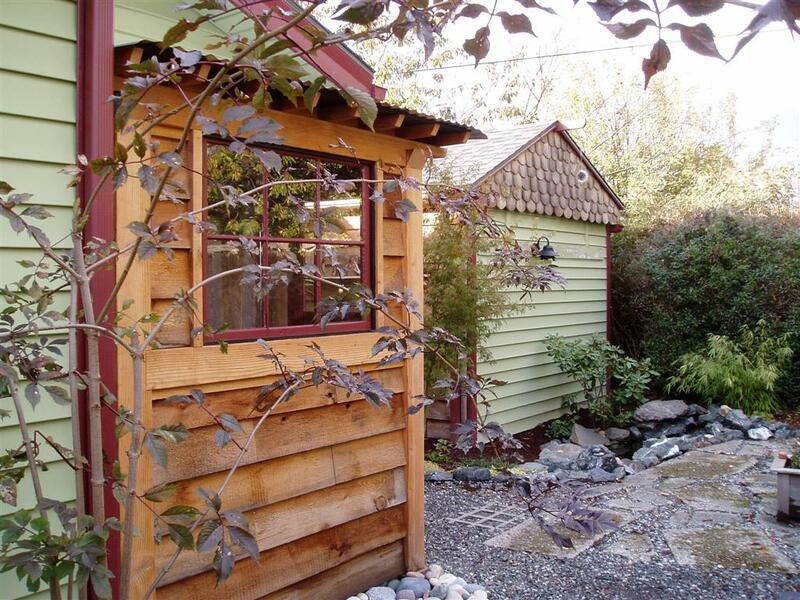 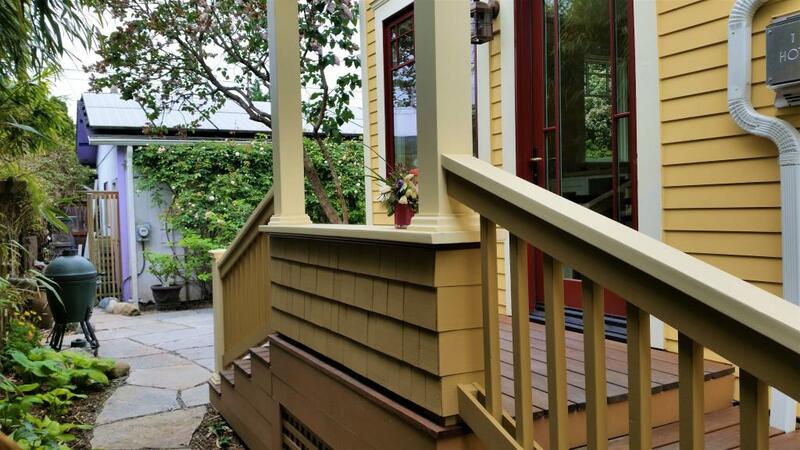 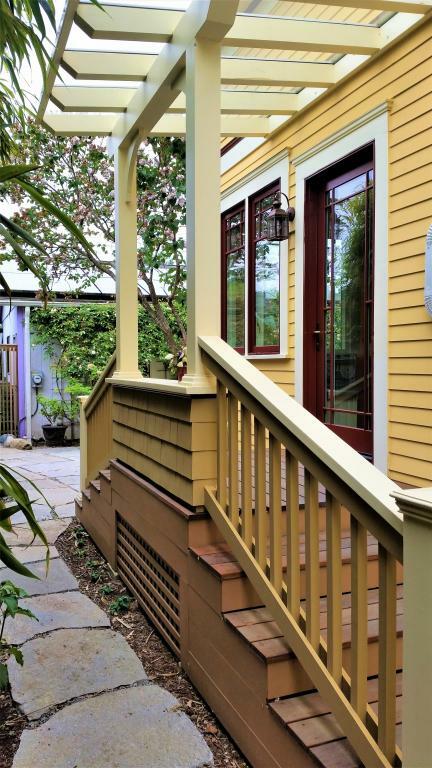 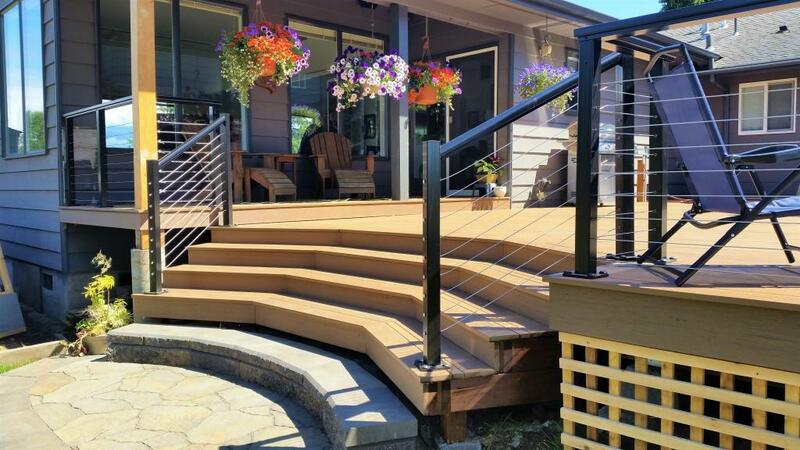 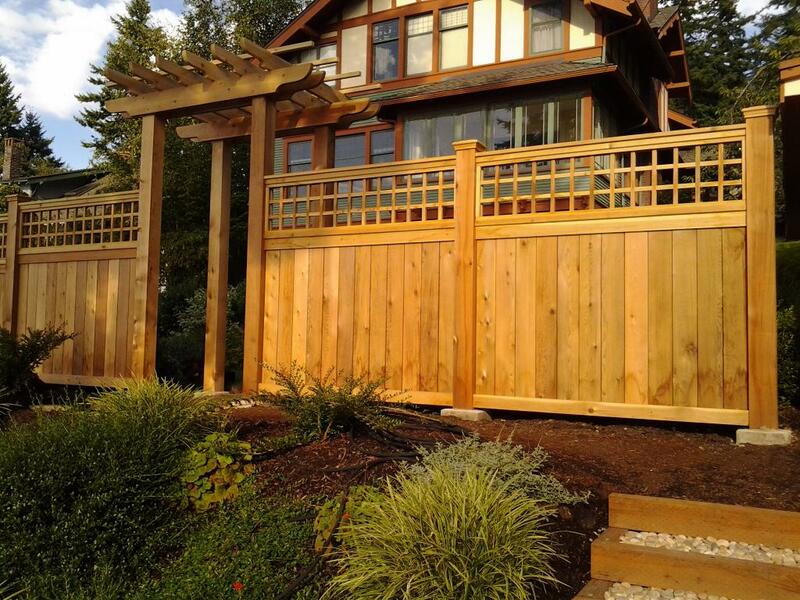 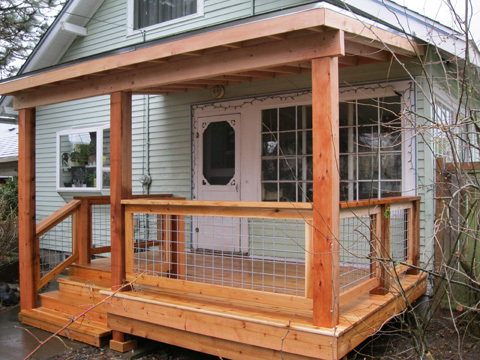 This fence was created as an architectural extension of the beautiful craftsman home it accompanies. 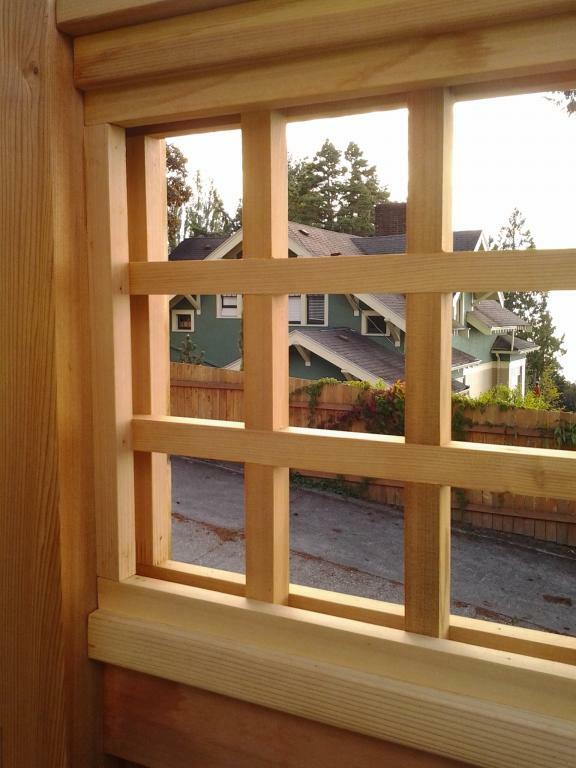 The 6 X 6 cedar posts give a massive feel, but not at the expense of the fine detail of the fully jointed lattices (no stapled sticks here). 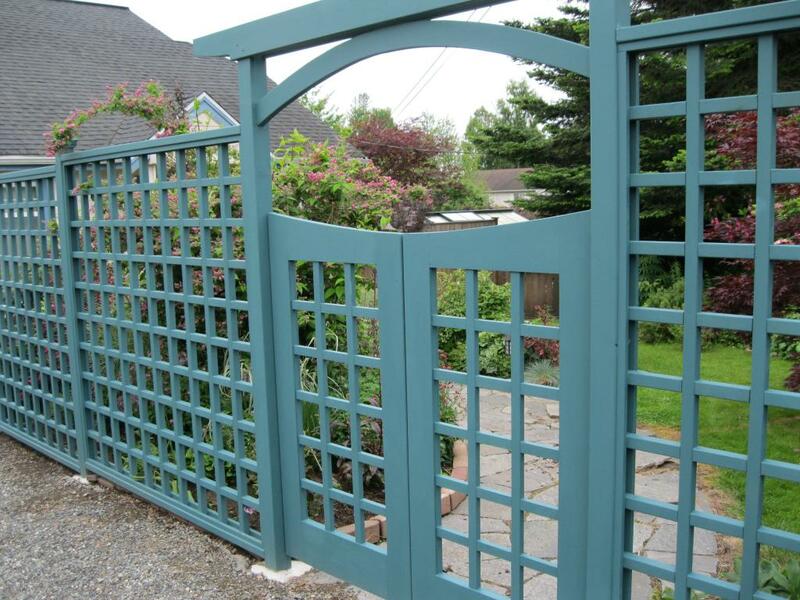 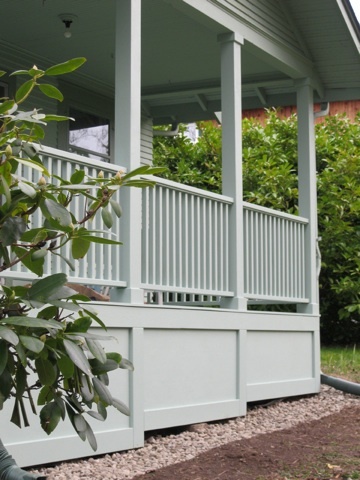 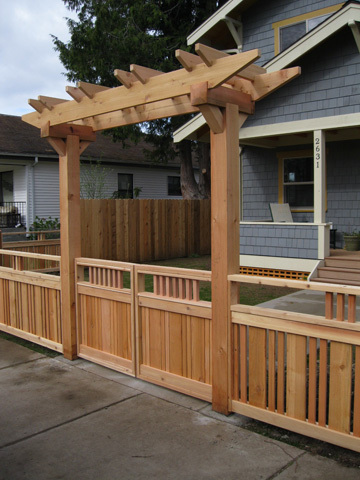 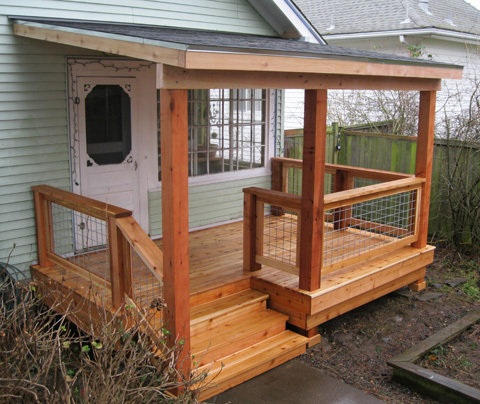 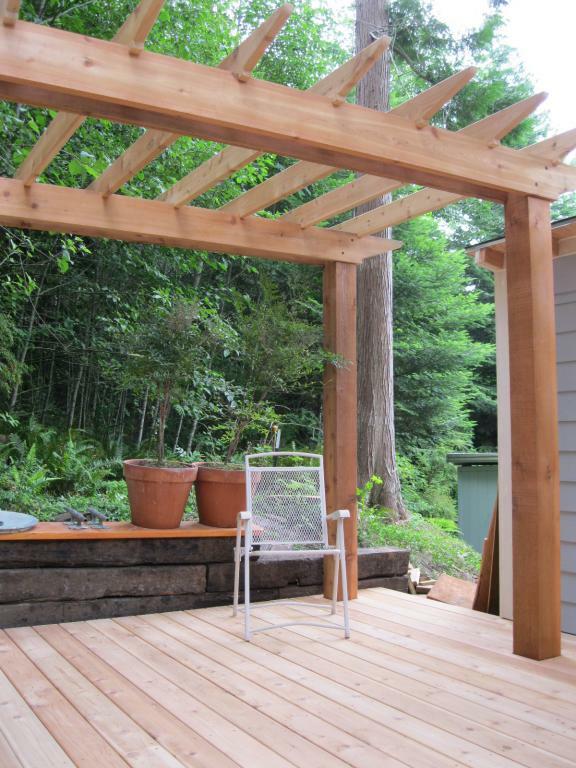 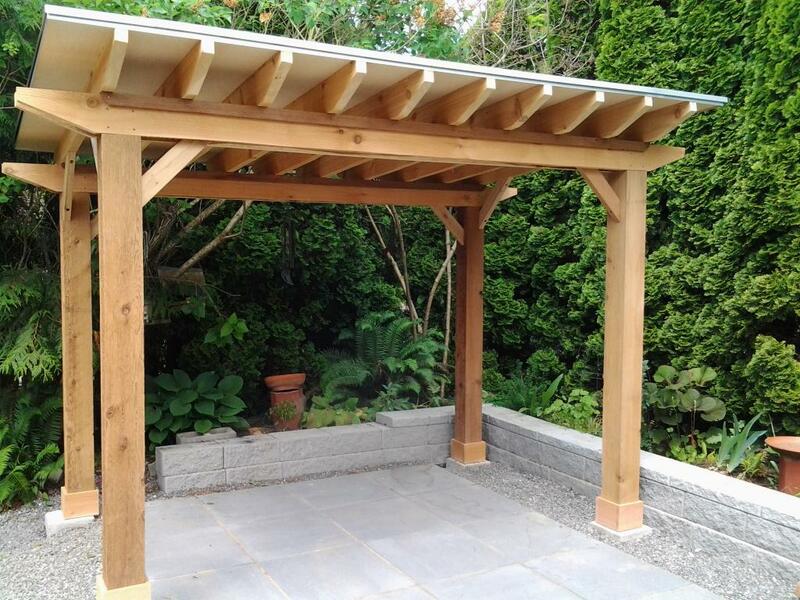 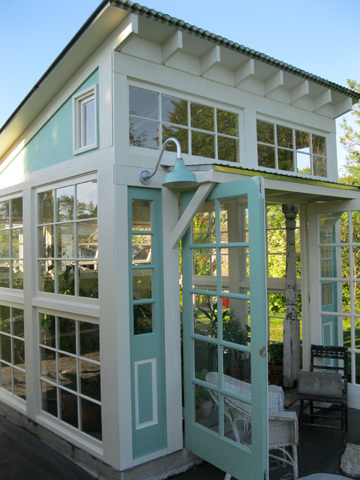 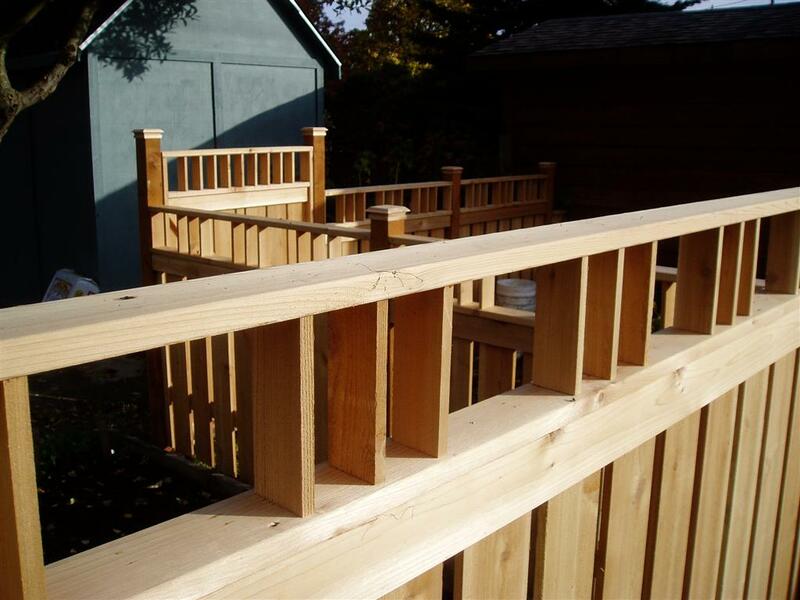 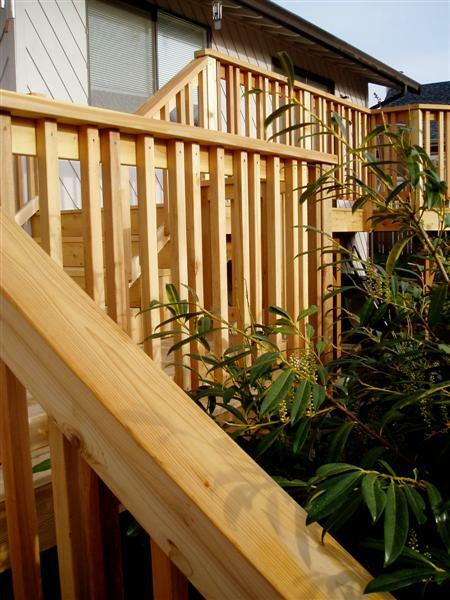 From the squared and beveled footings to the classic arbor, this fence was a joy to build! 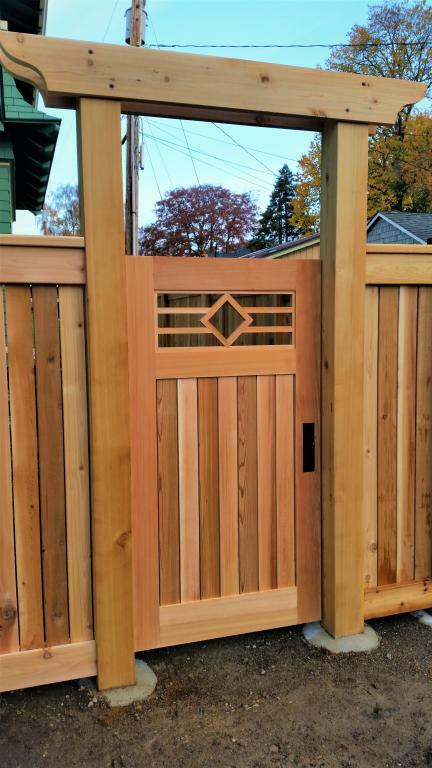 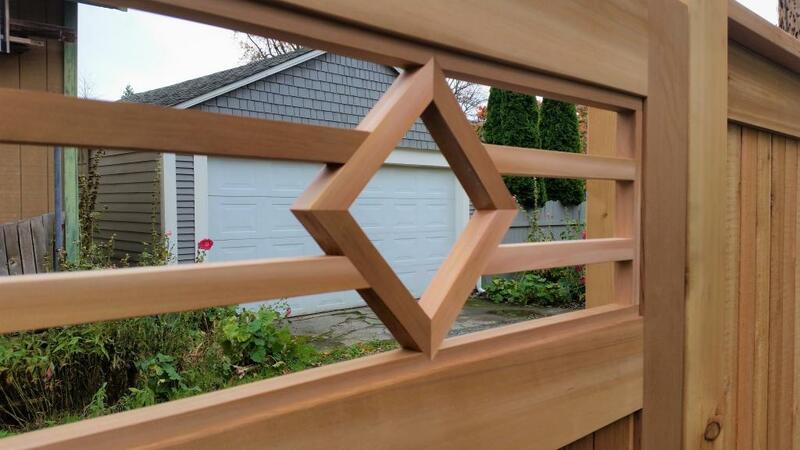 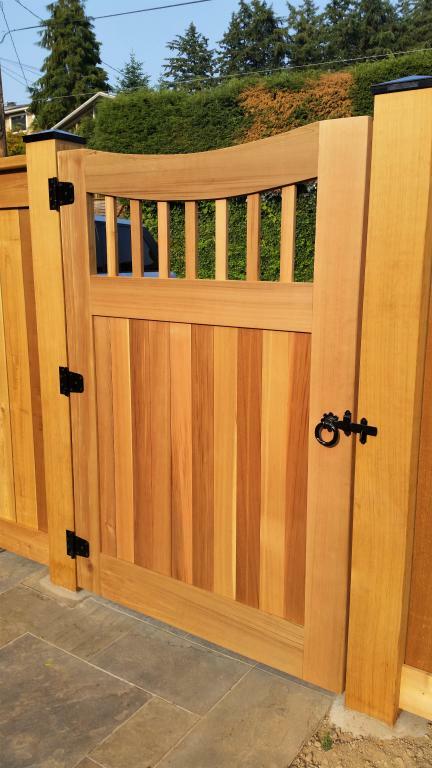 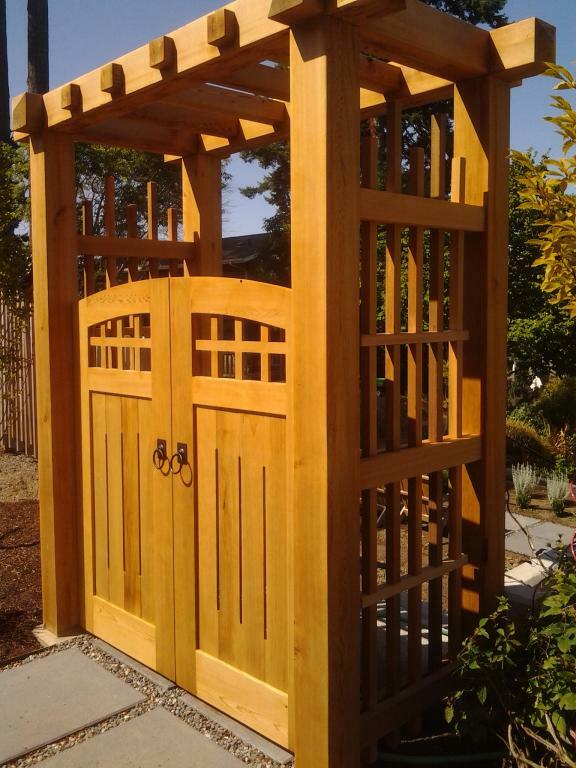 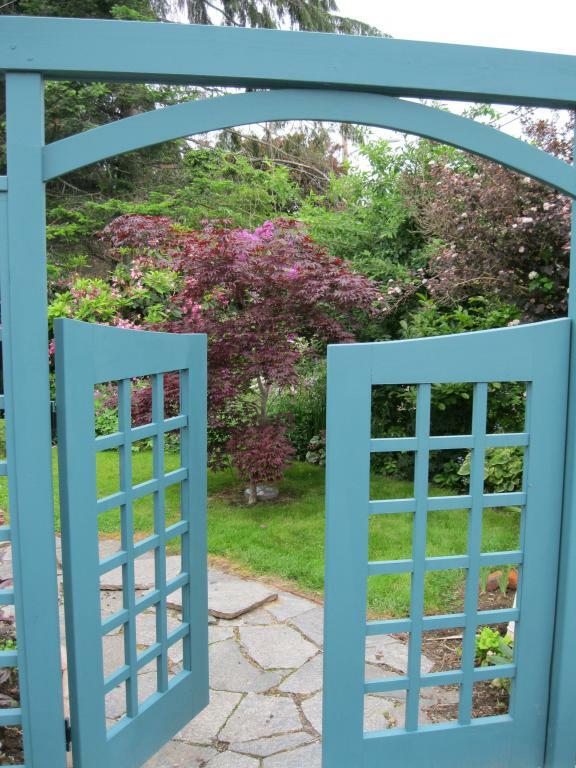 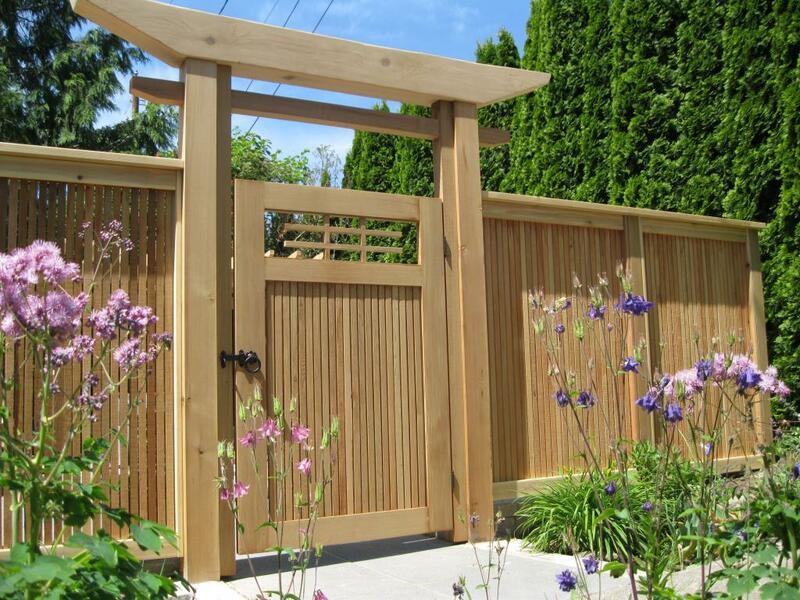 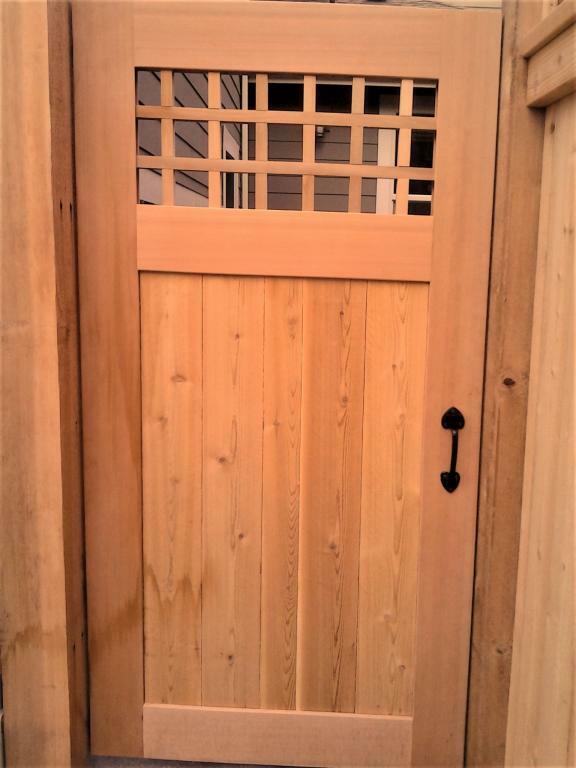 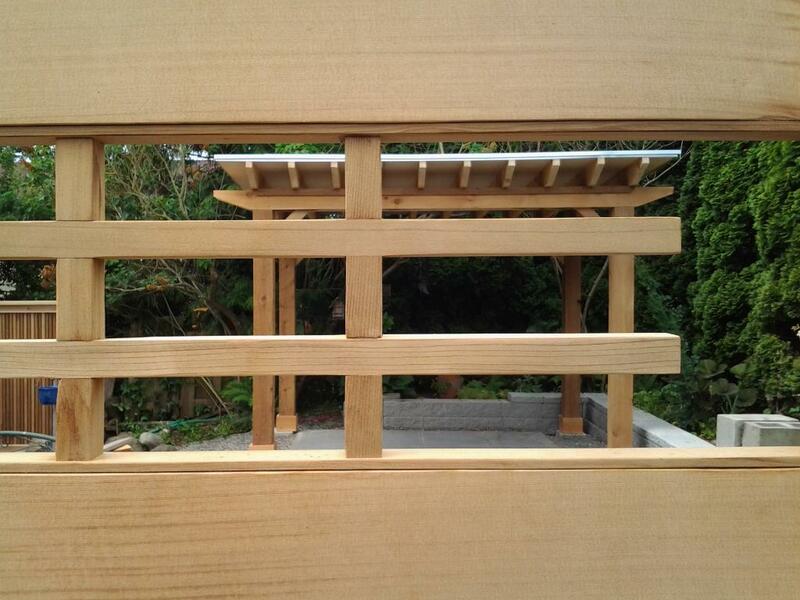 The close spacing of verticle lines coupled with a torii-like gate in this fence project gives it a distinctly Asian feel. 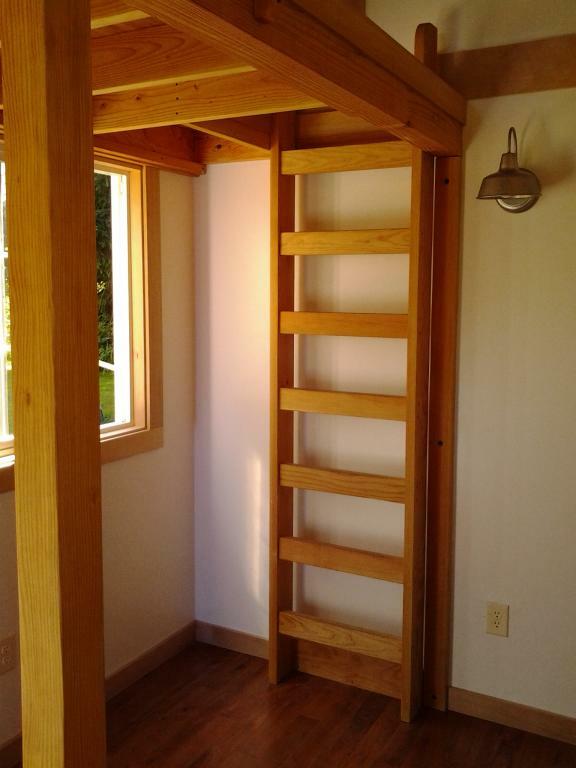 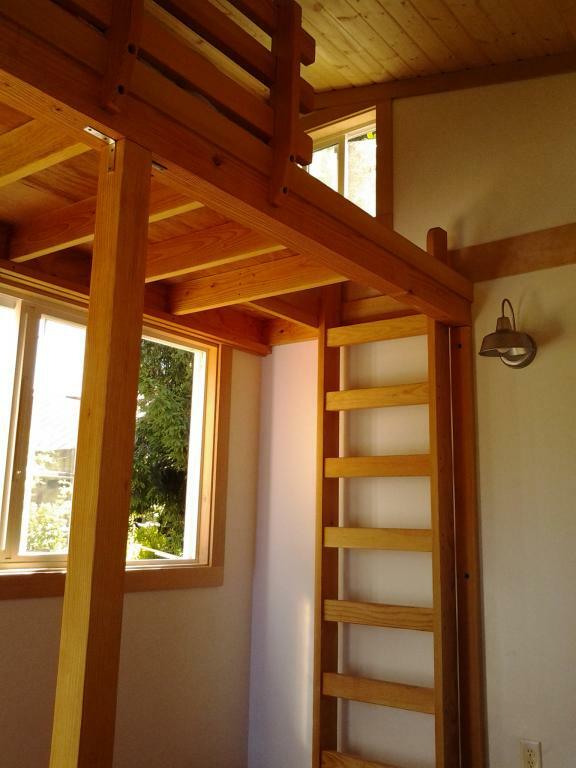 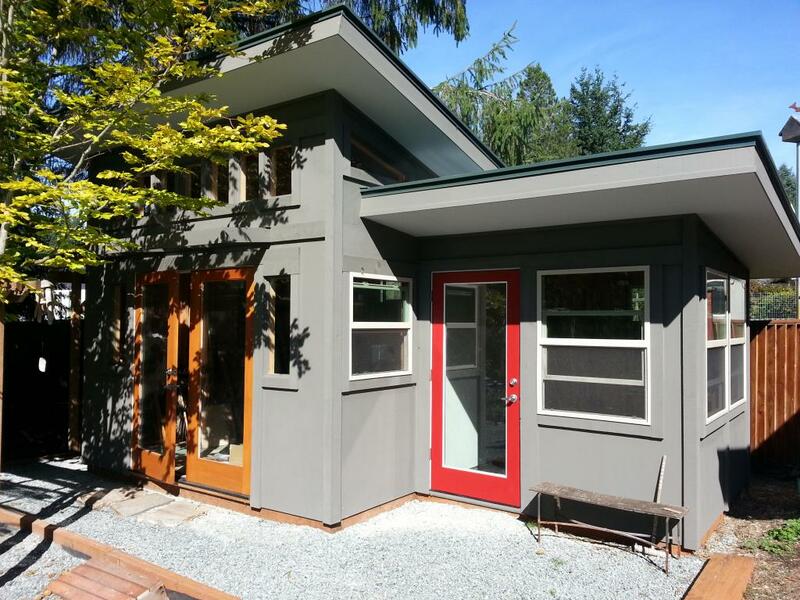 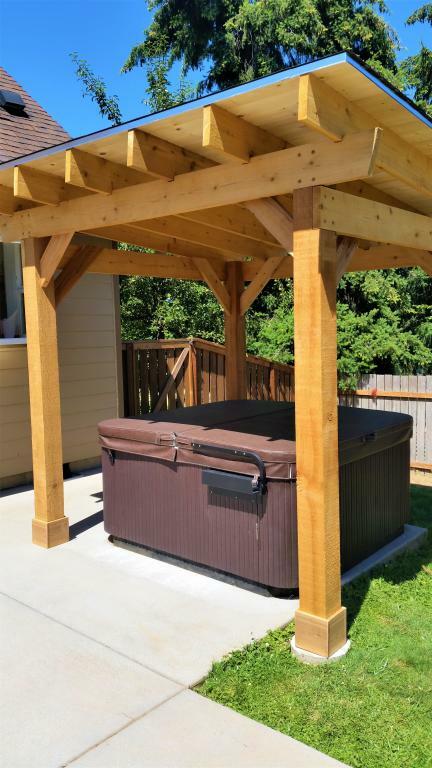 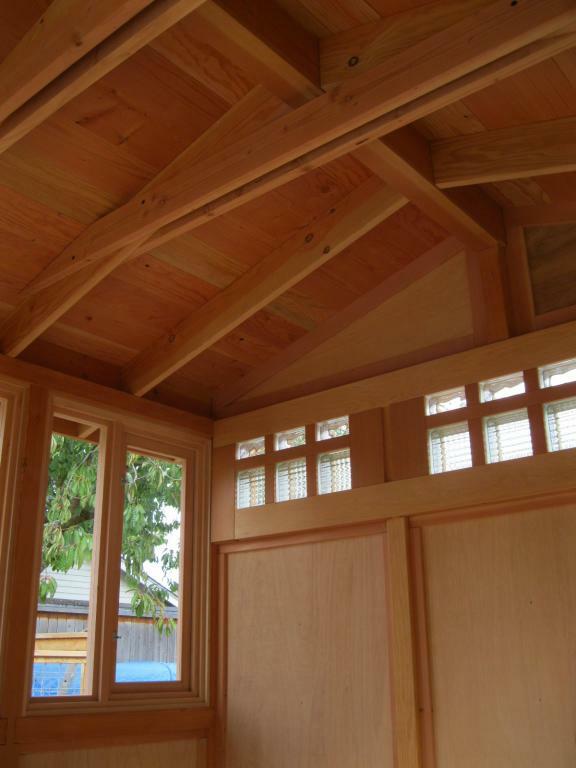 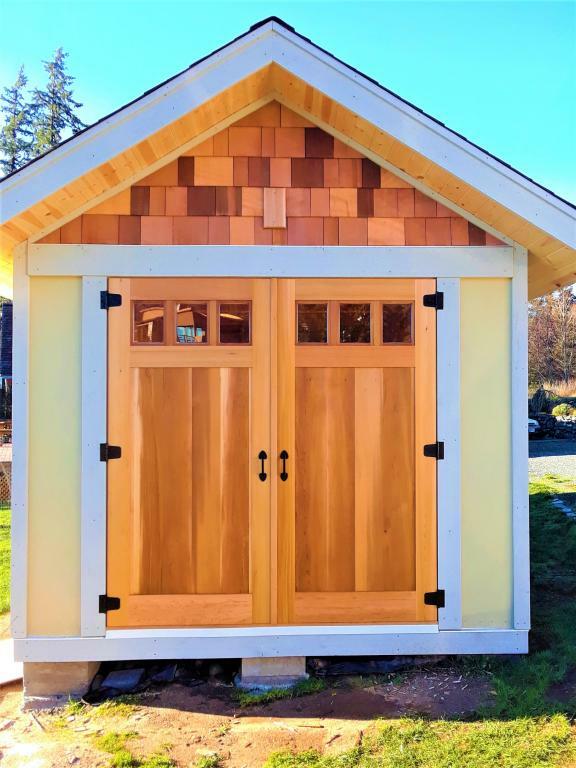 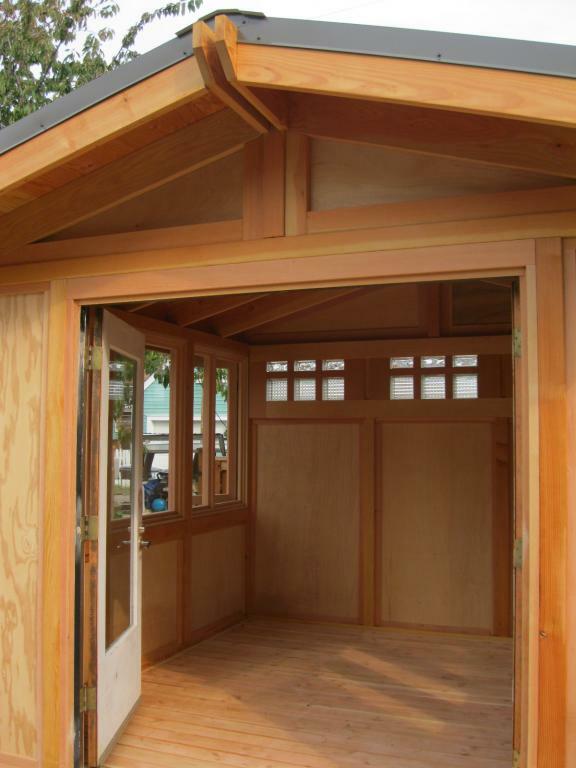 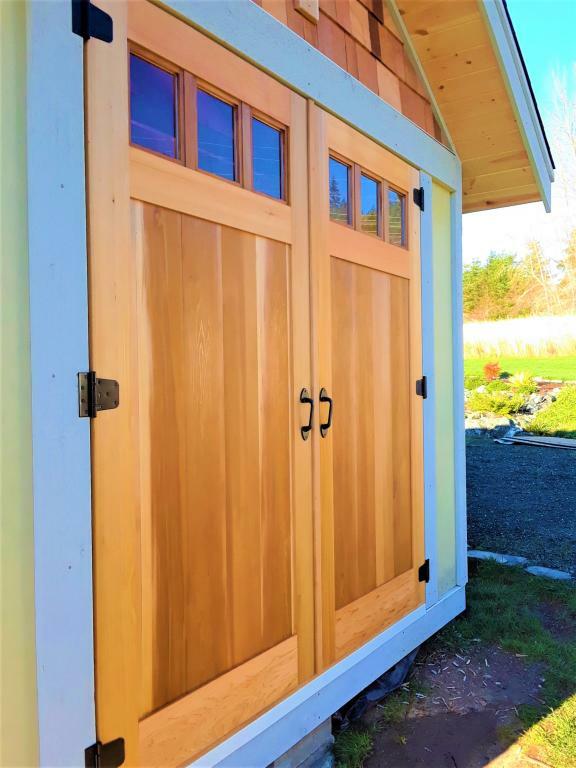 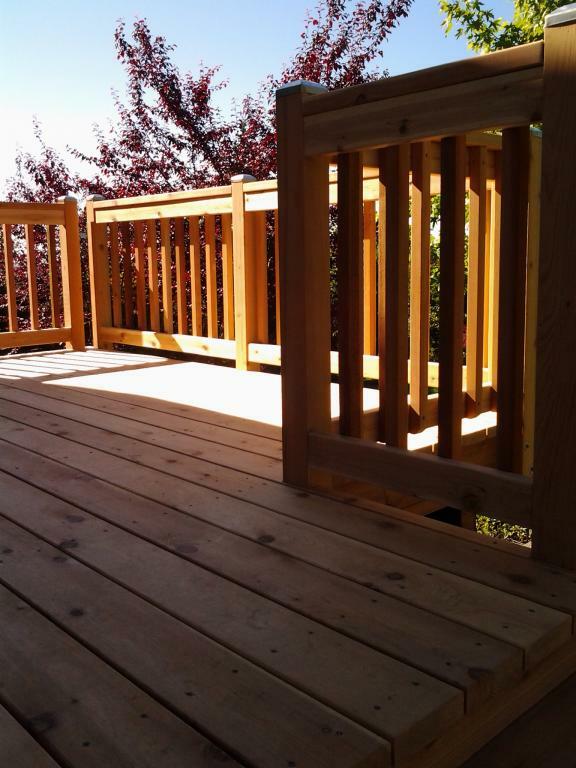 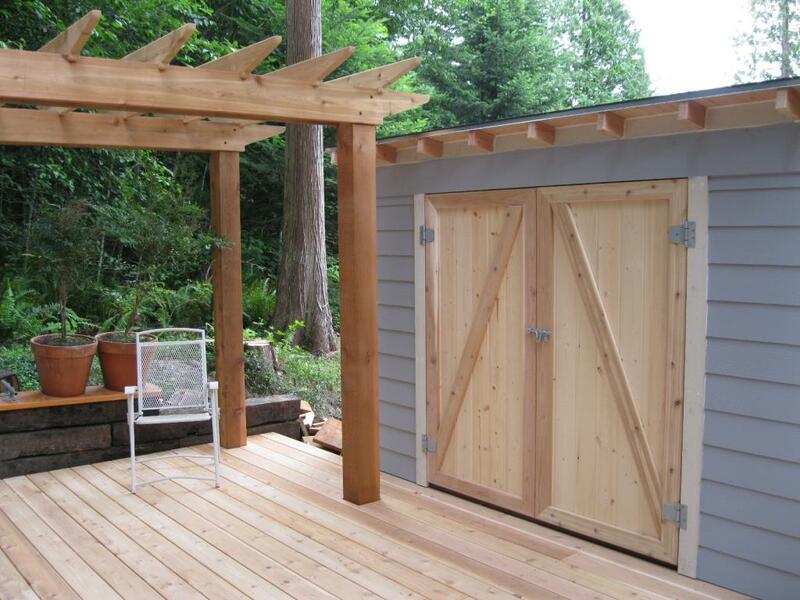 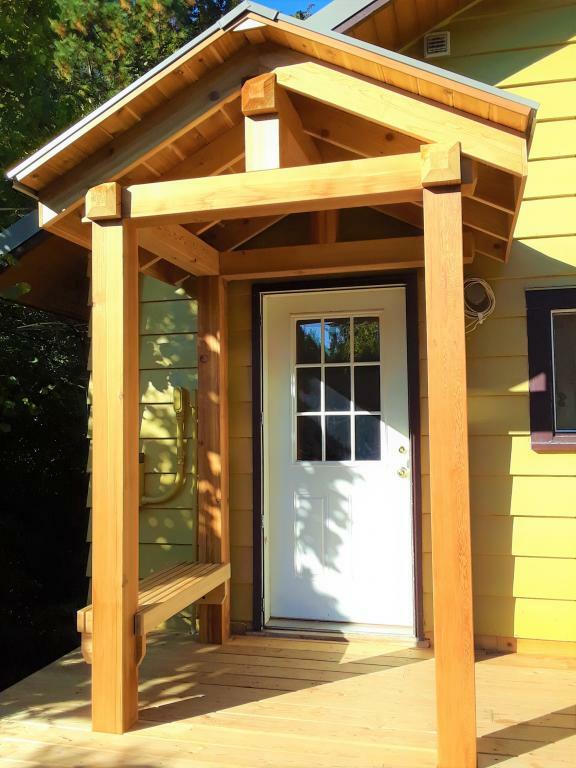 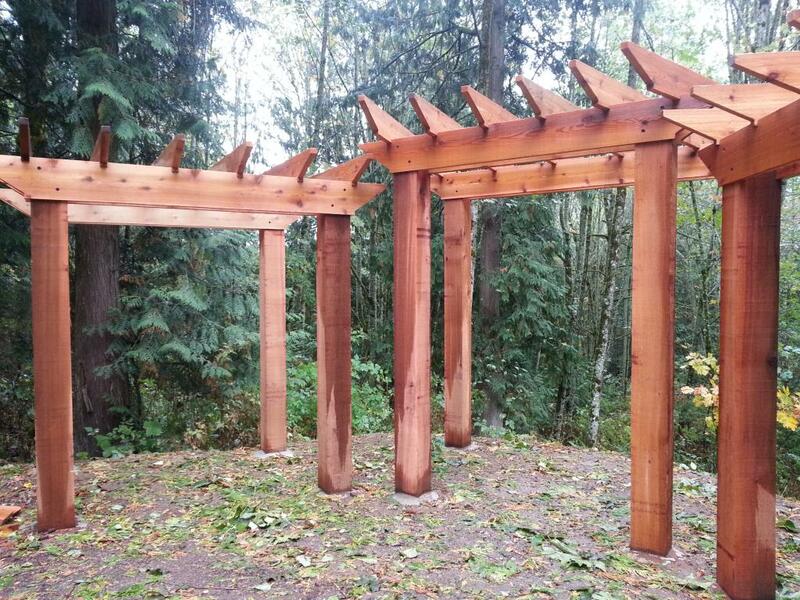 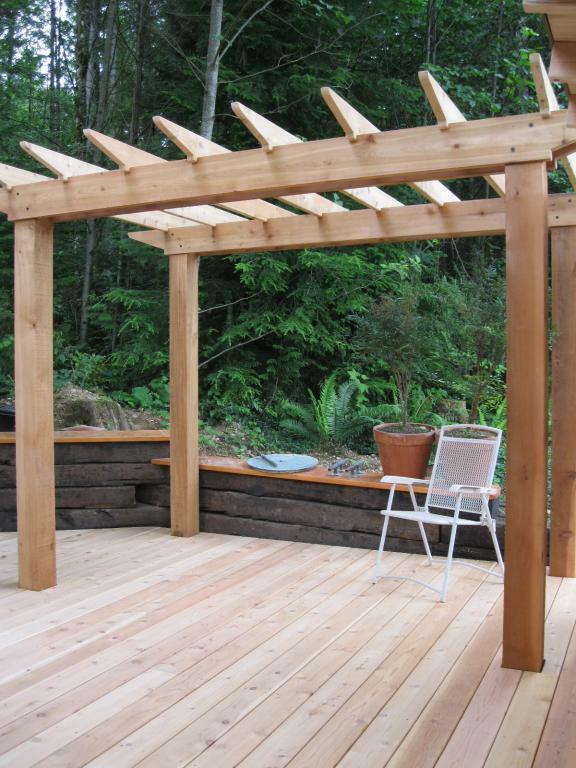 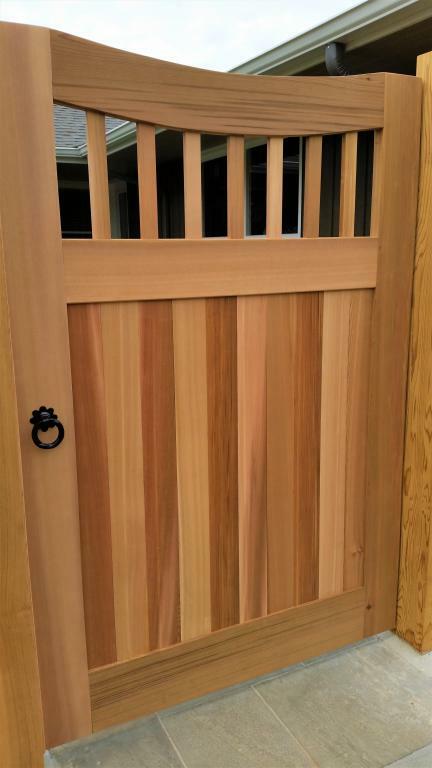 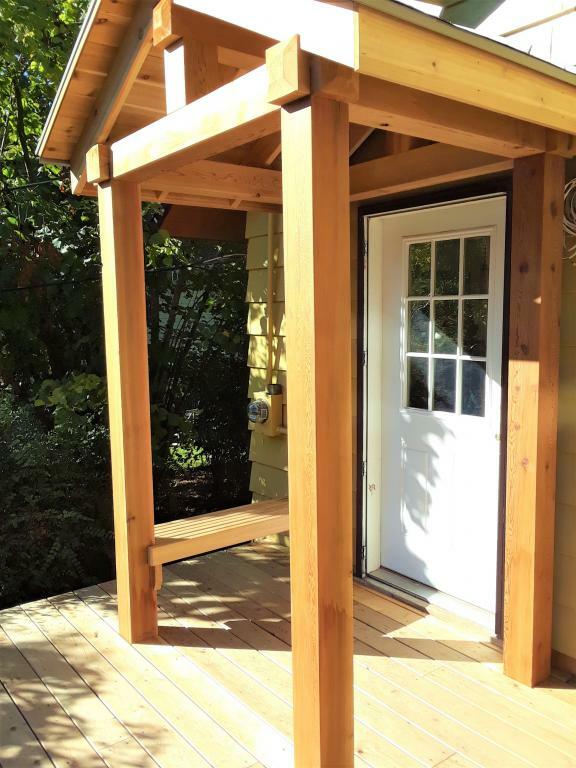 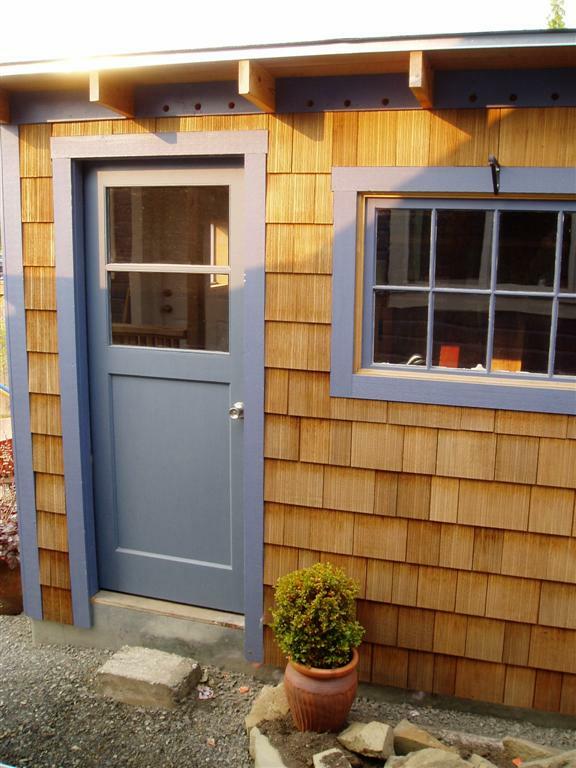 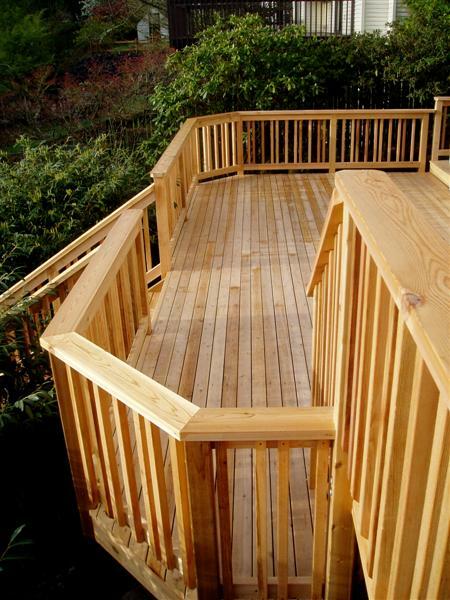 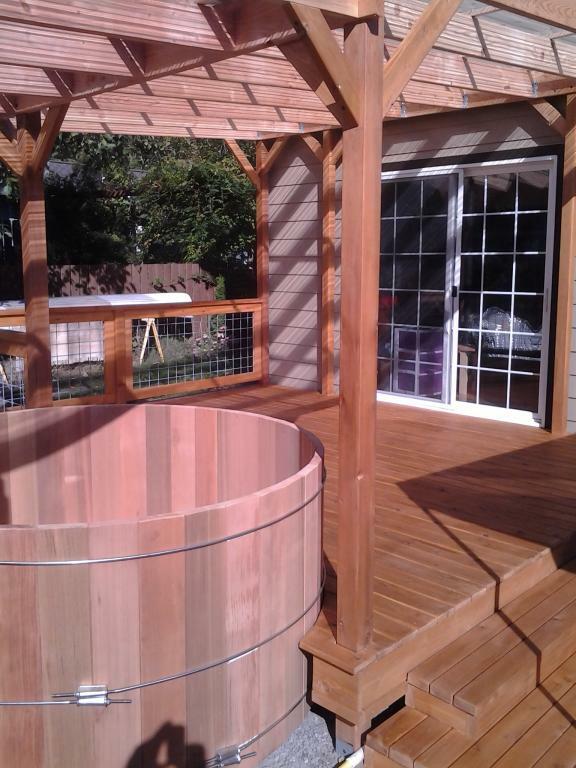 Made entire of western red cedar-some of it even harvested and milled in Whatcom county-this project's intent was to add privacy as well as artistically compliment the owner-built "zen" patio within. 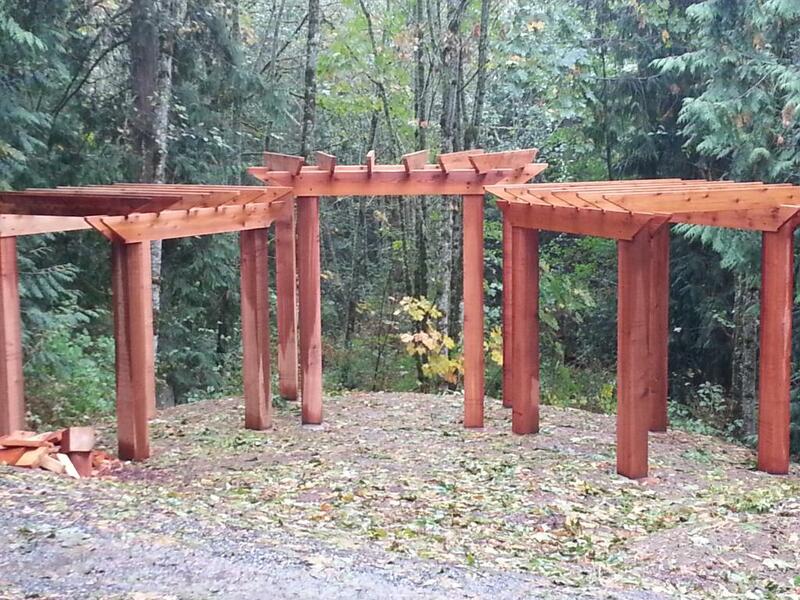 We also built a small covered meditation spot in one corner from which to contemplate drops of rain. 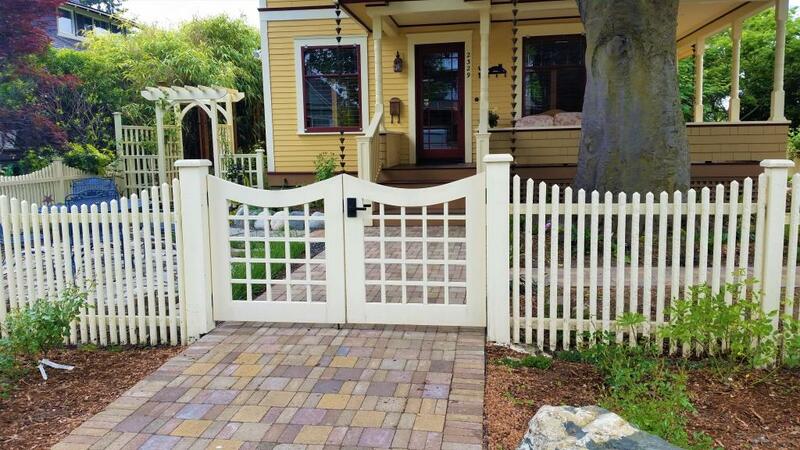 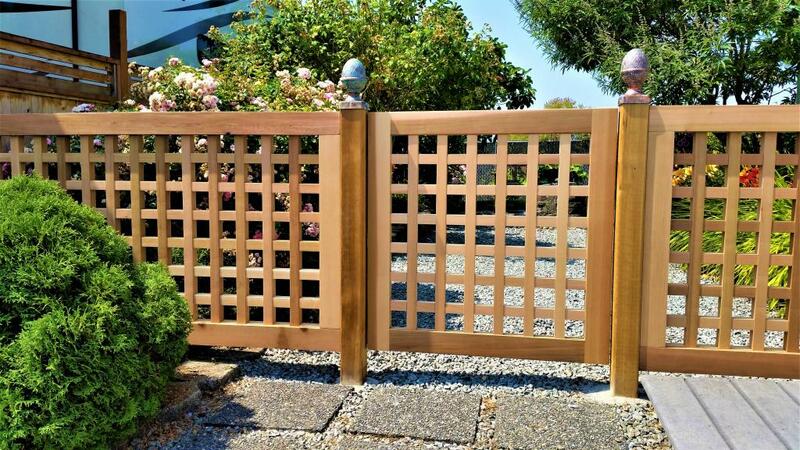 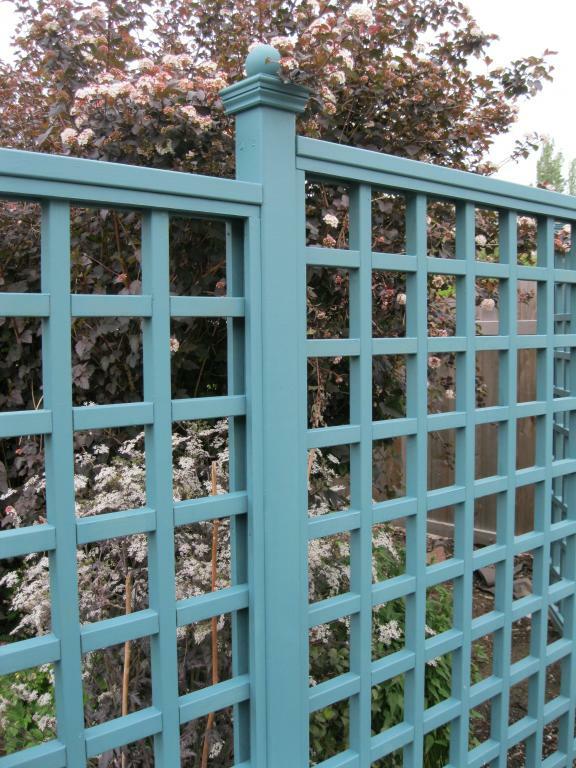 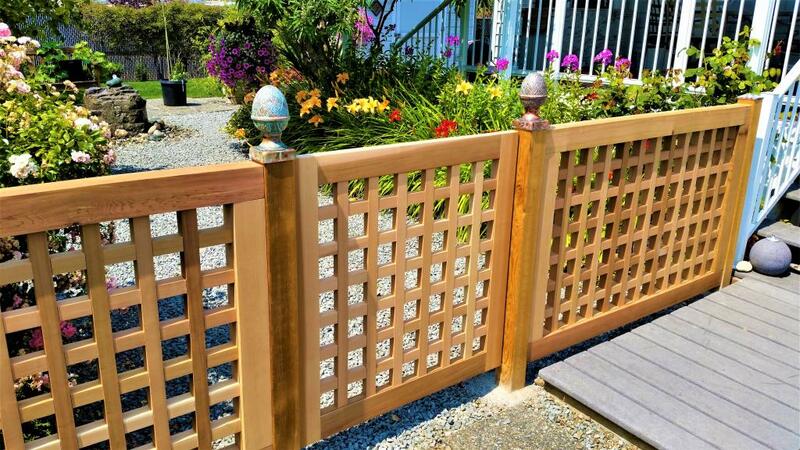 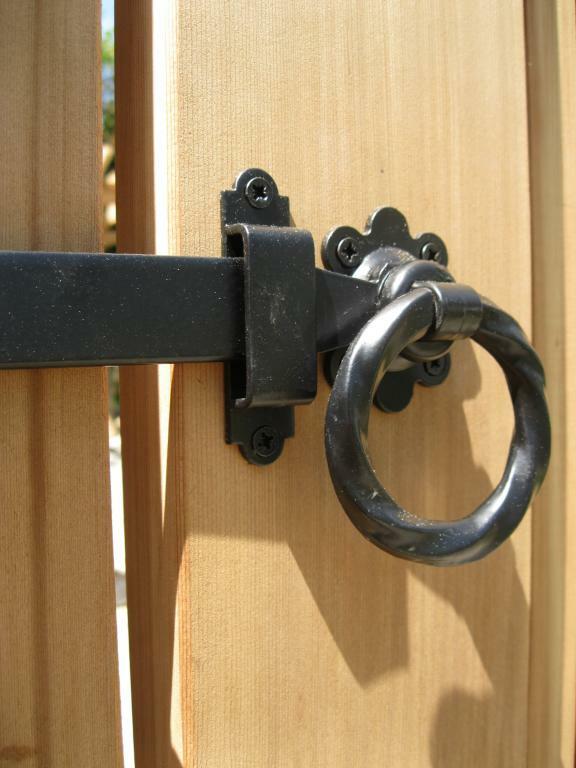 While a fence’s primary function is typically as a boundary marker or critter barrier, it can also serve as an extension of a home’s aesthetic. 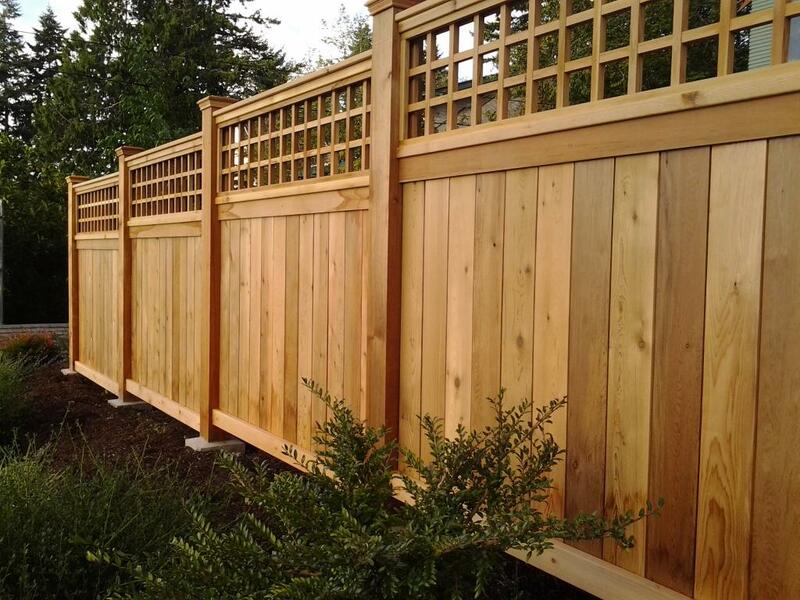 We worked closely with our client here to create a well-crafted fence that would both complement and enhance the property it surrounded. 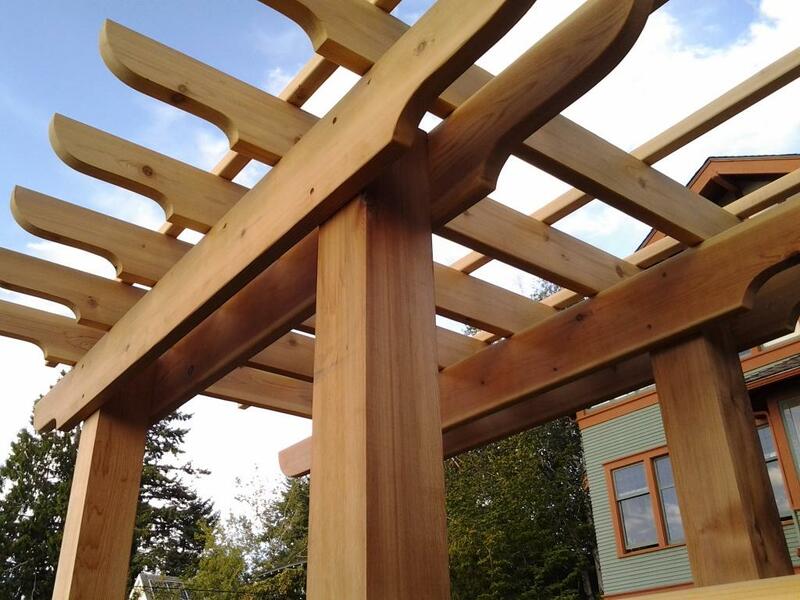 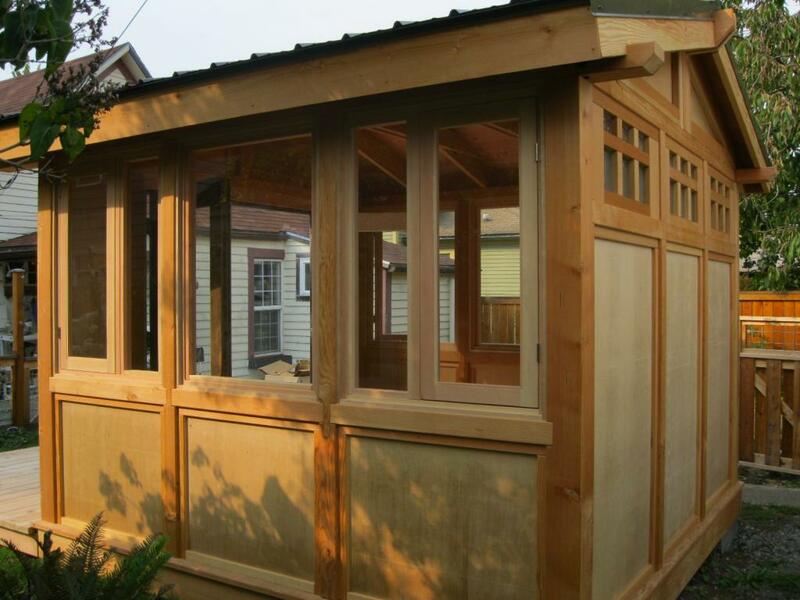 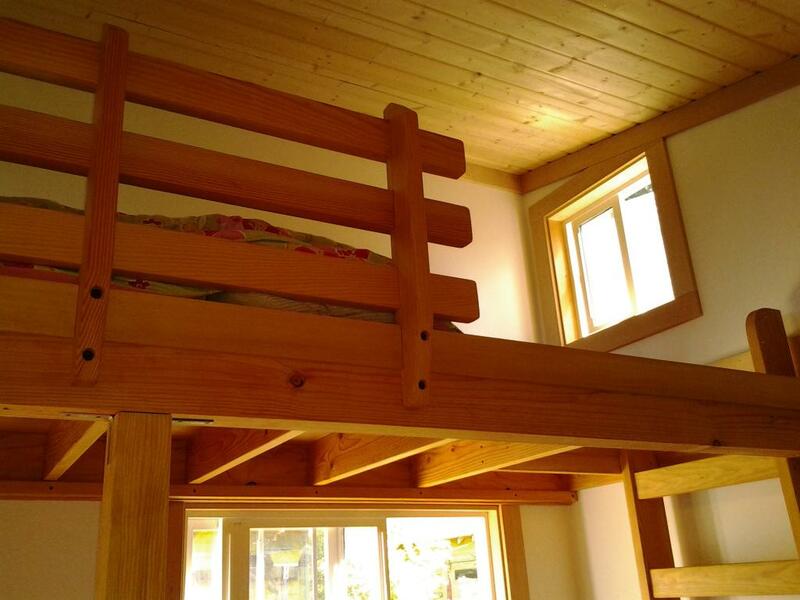 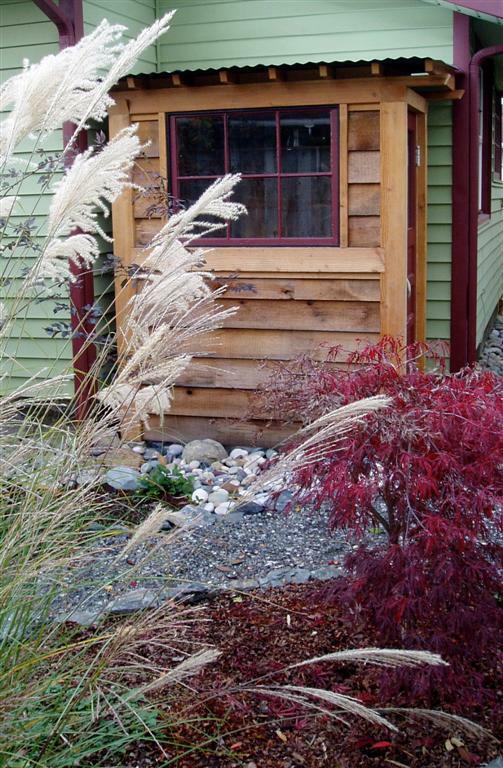 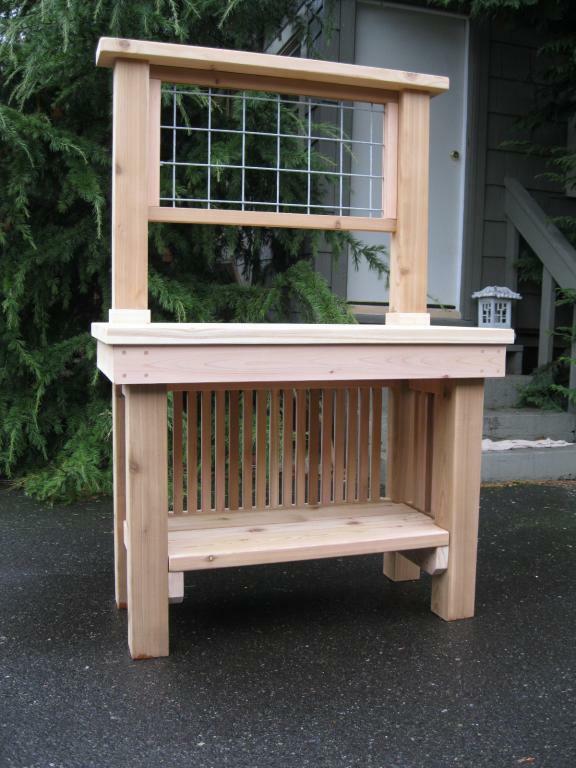 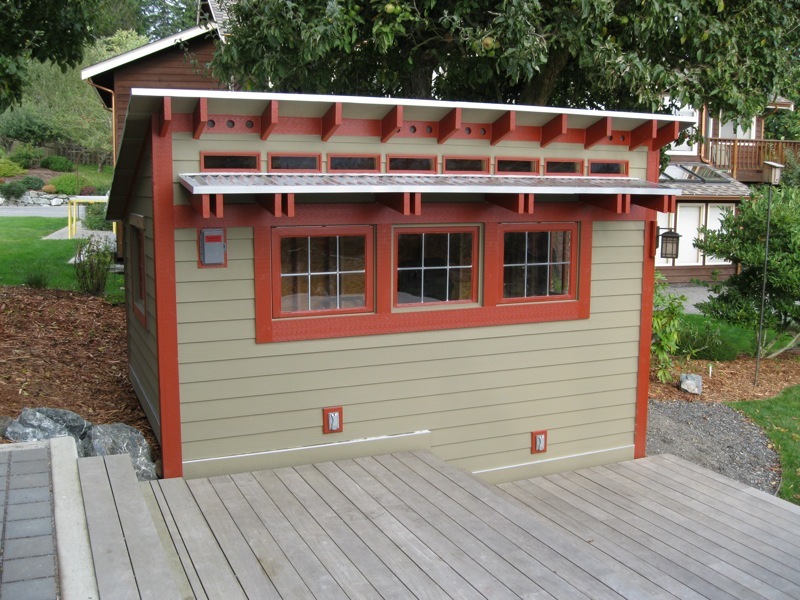 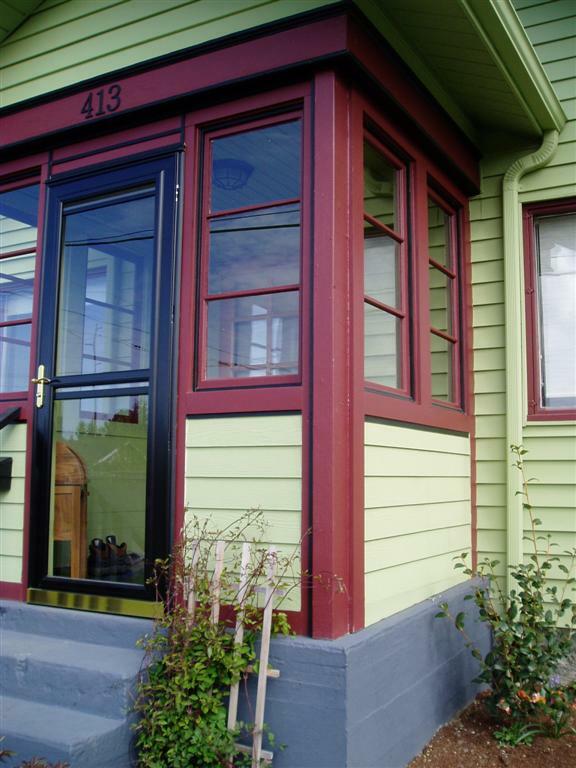 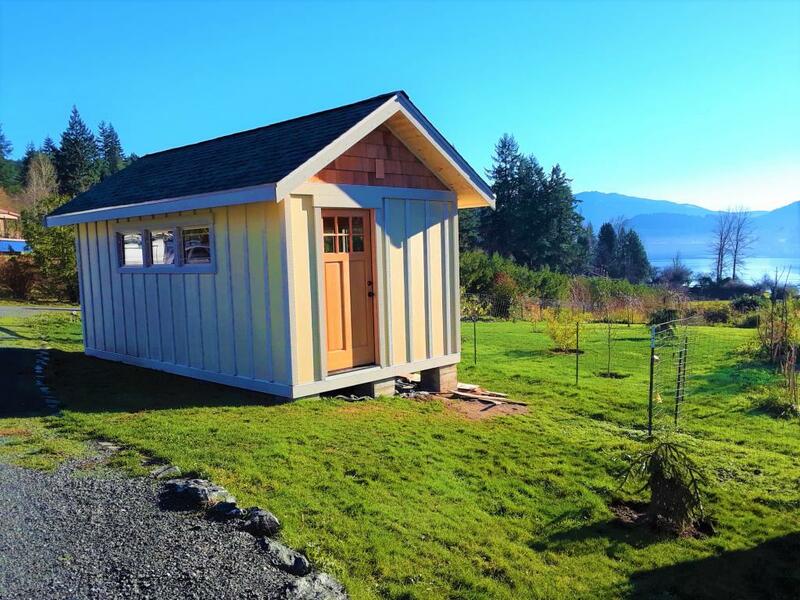 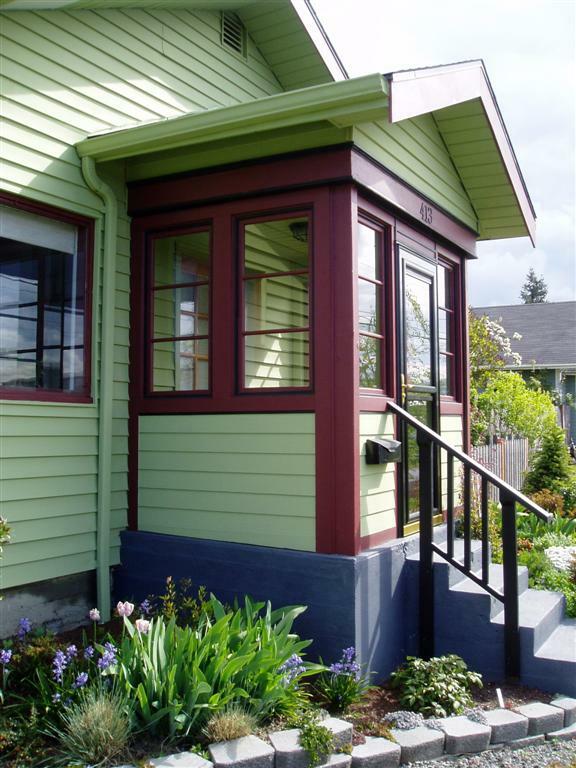 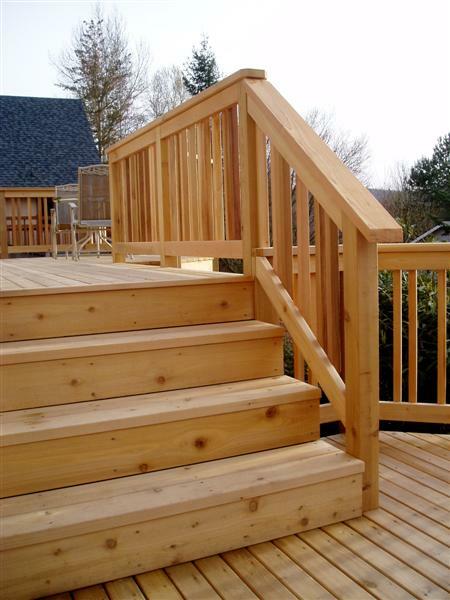 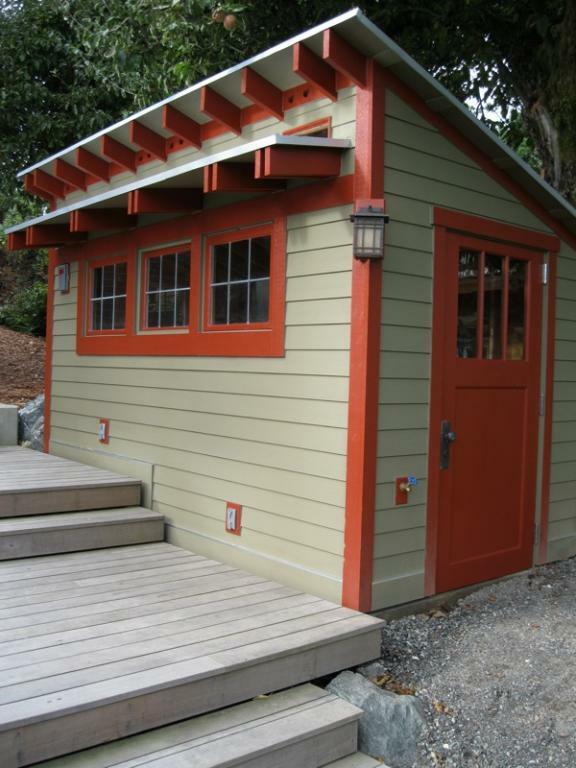 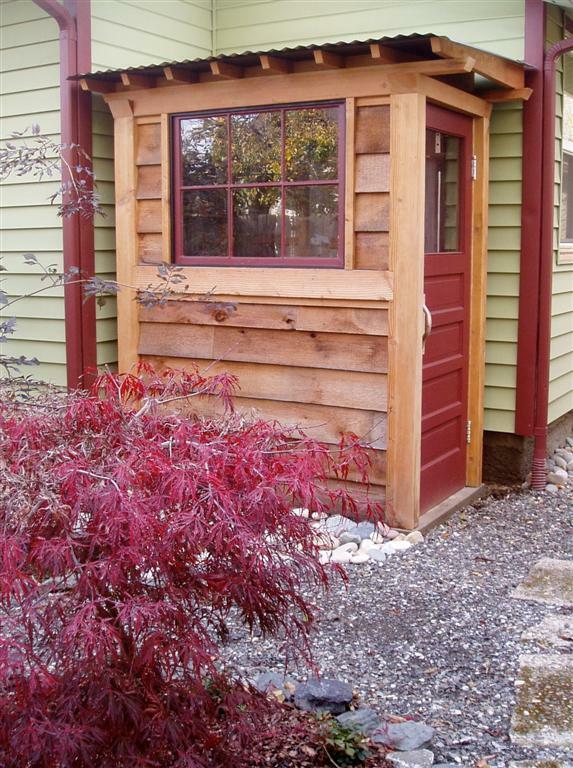 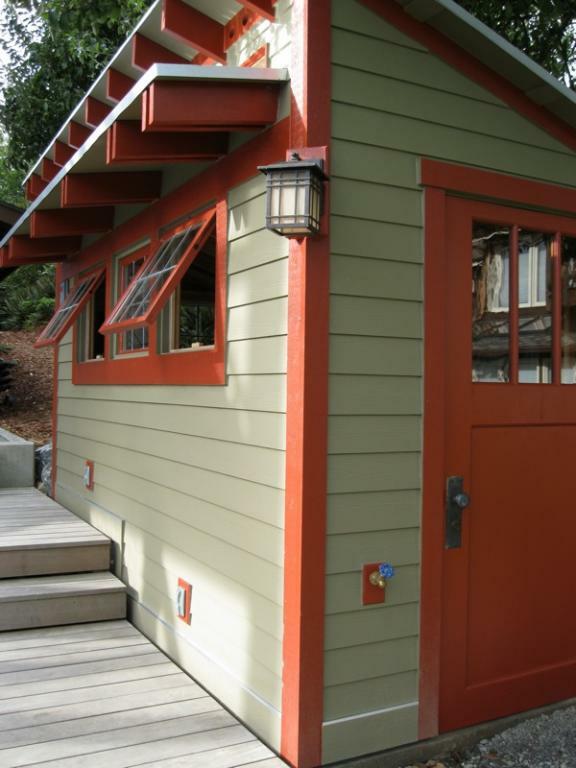 A hint of the Craftsman style coupled with the warm beauty of western red cedar is almost always a winning combination. 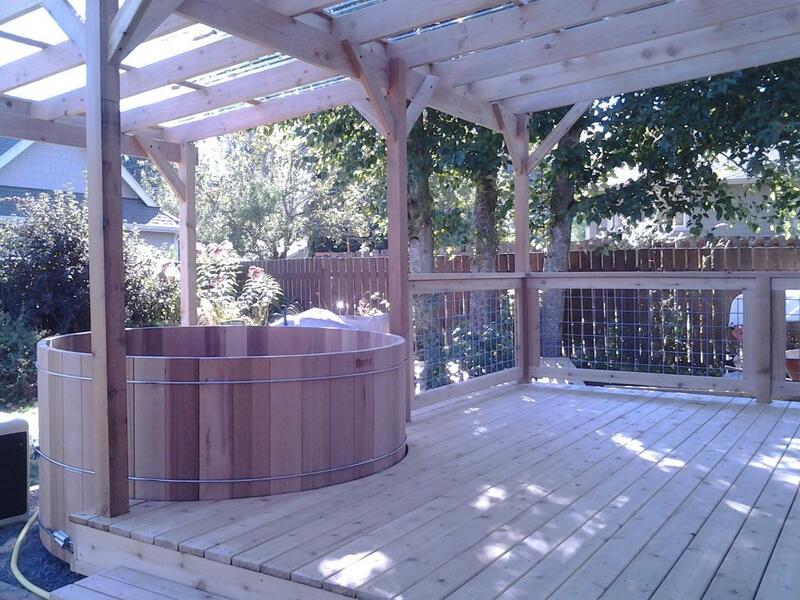 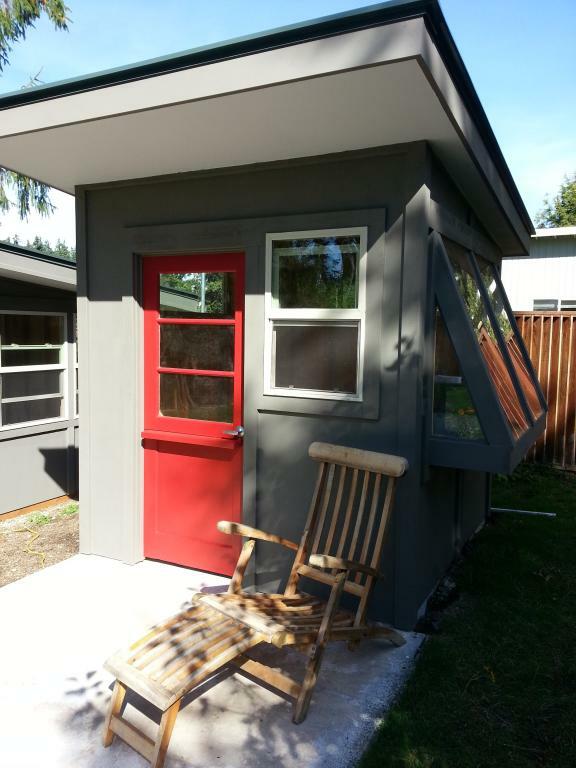 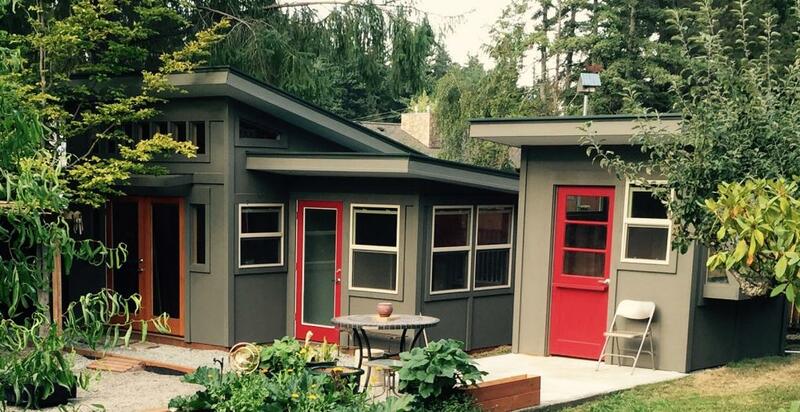 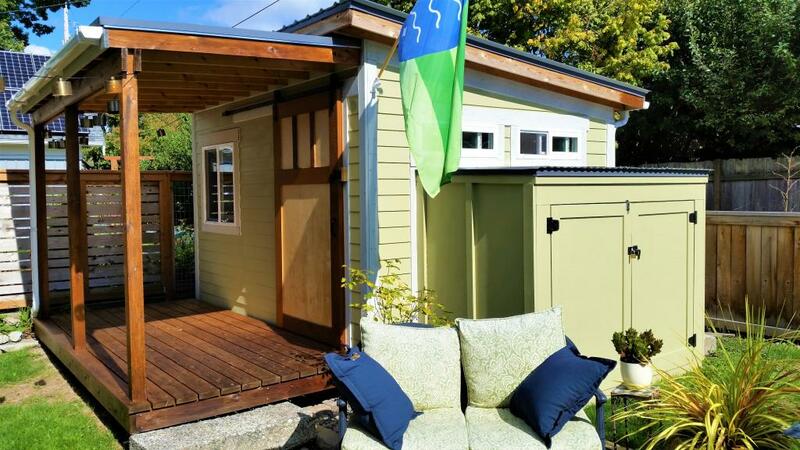 Sometimes a family member can be the catalyst for a home project. 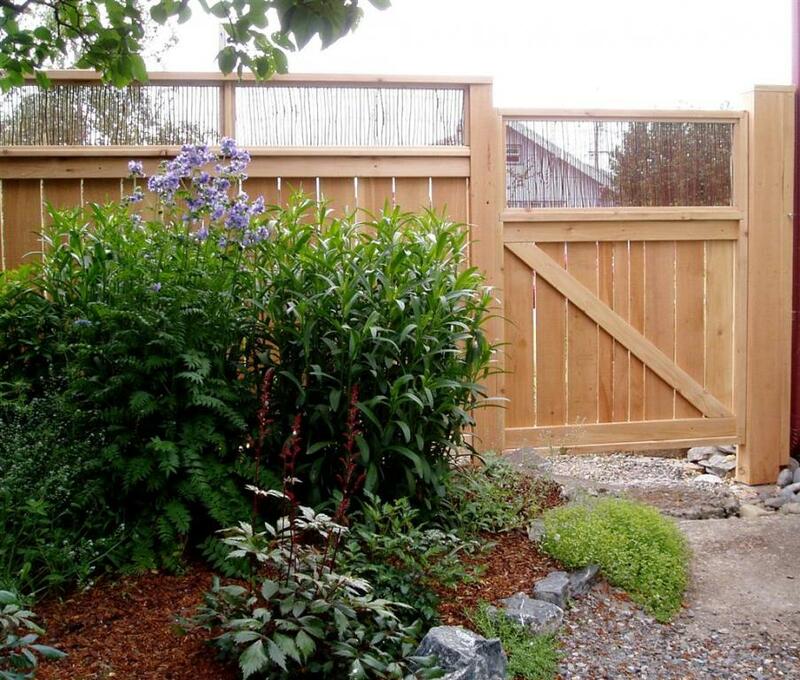 In this case, a sweet but cat-chasing dog compelled our client to commission a fence for their double lot. 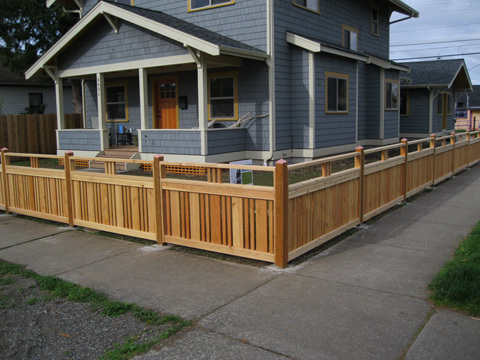 The primary objectives were to have an unobtrusive fence that wasn't a visual barrier to the neighborhood, and to create an attractive addition to the property. 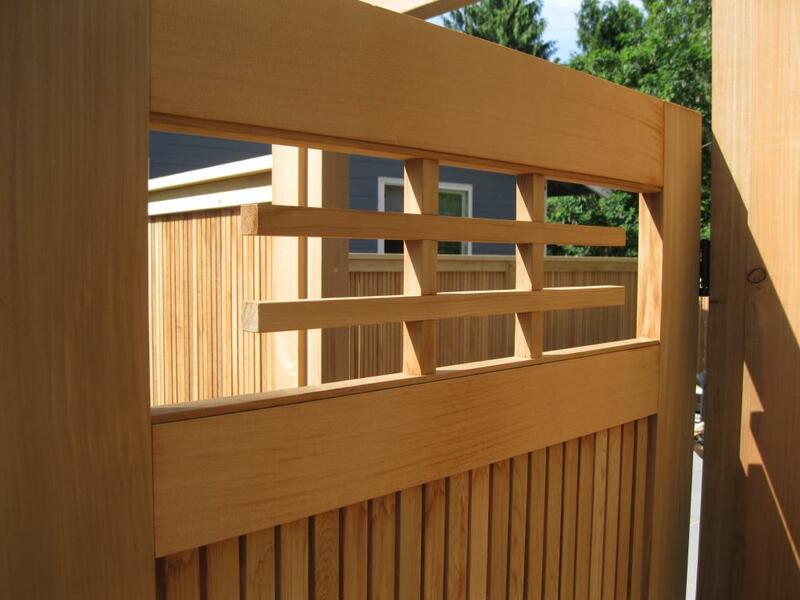 Aside from the steel grid panels, the fence is constructed entirely of western red cedar; even the posts. 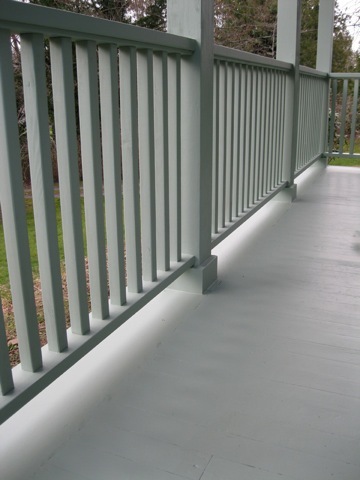 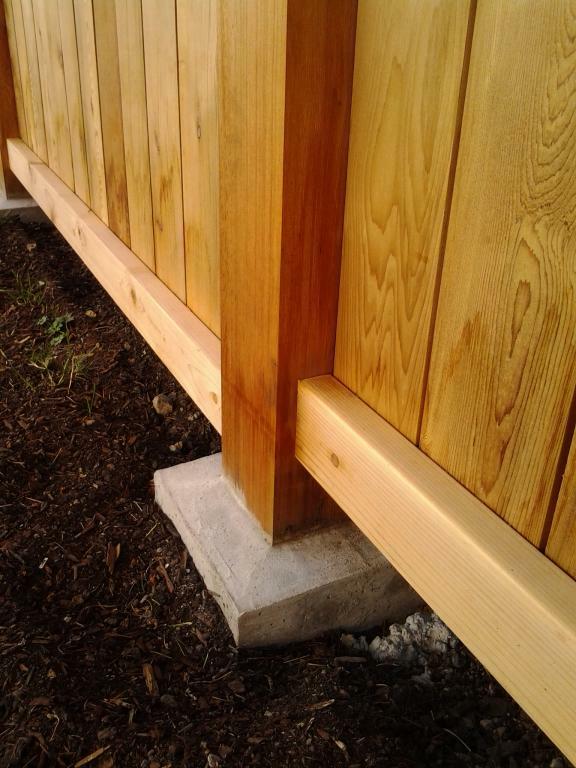 In addition to treating the posts with a product called Eco Wood Treatment, we wrapped each one at both grade-level and the bottom with Vycor flashing to ensure long life. 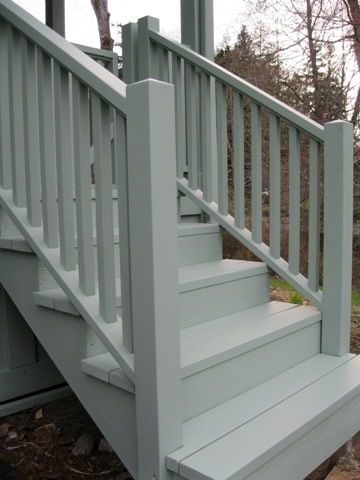 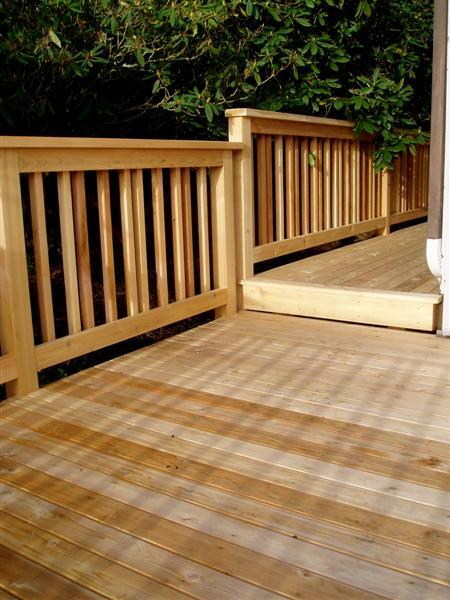 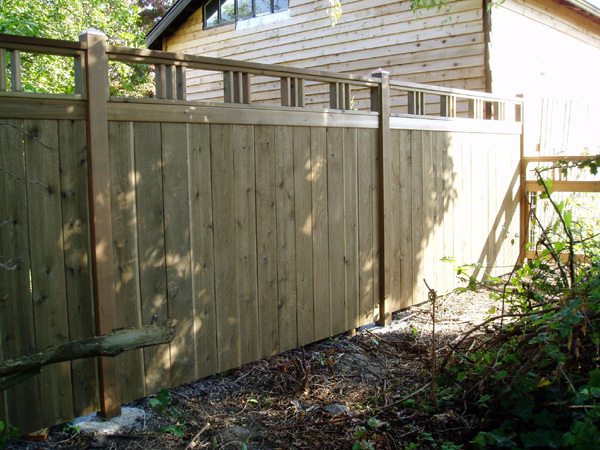 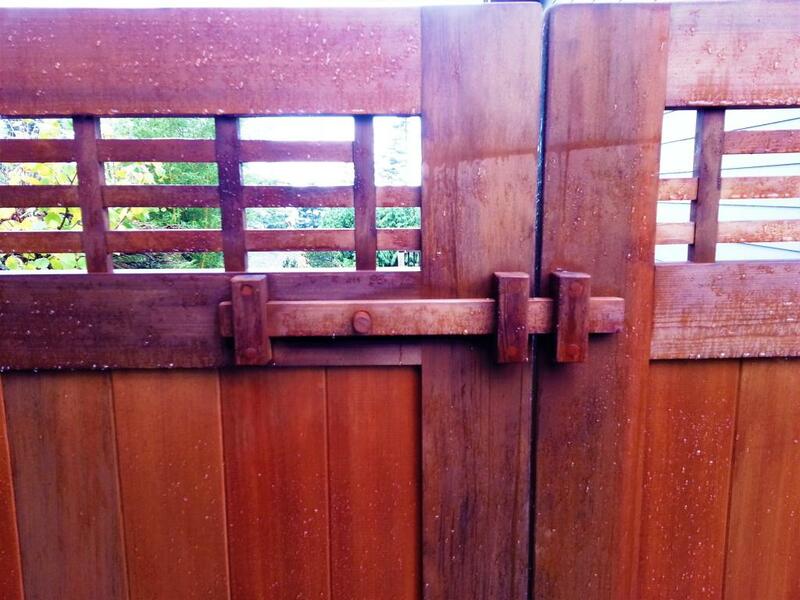 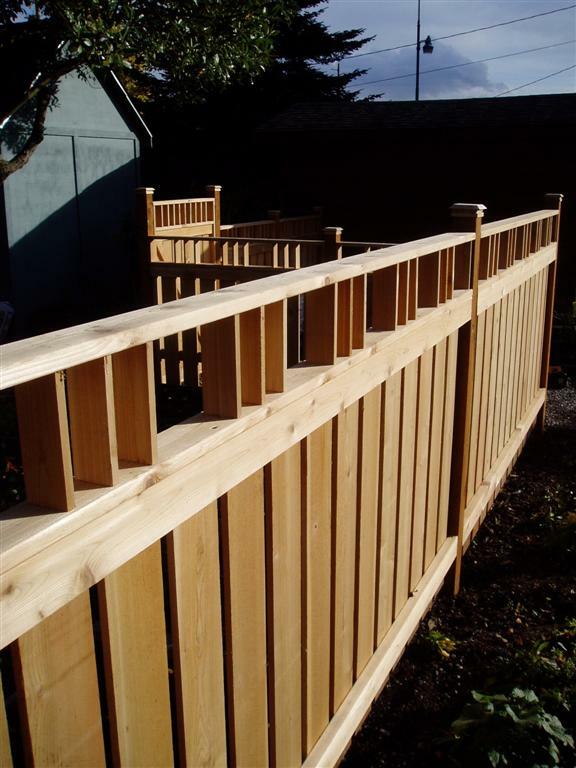 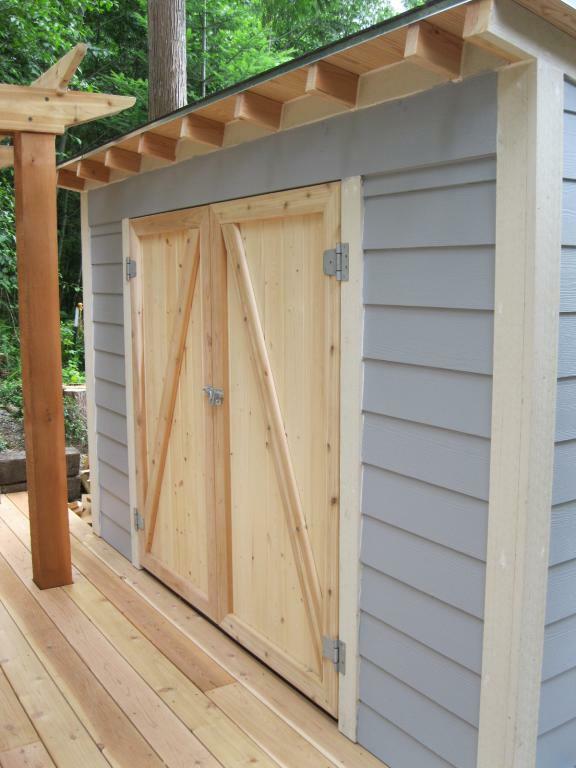 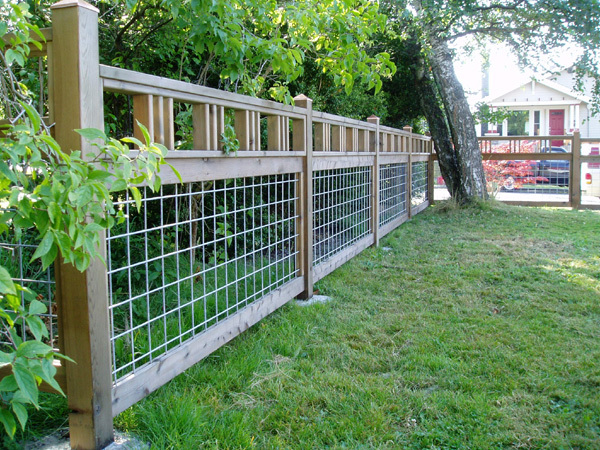 We also used Eco Wood Treatment as a stain for the fence, which turned the cedar a subtle silver-brown color. 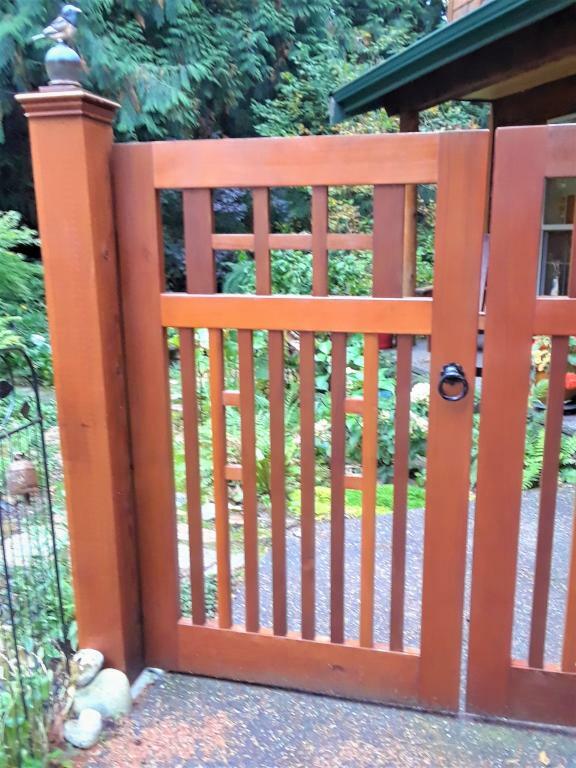 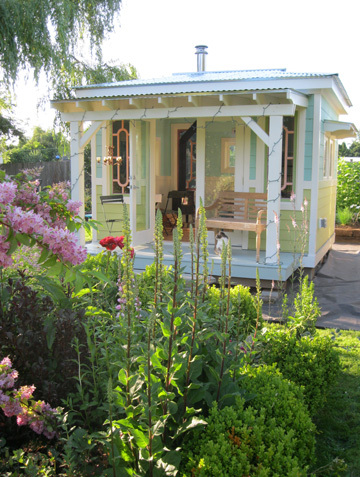 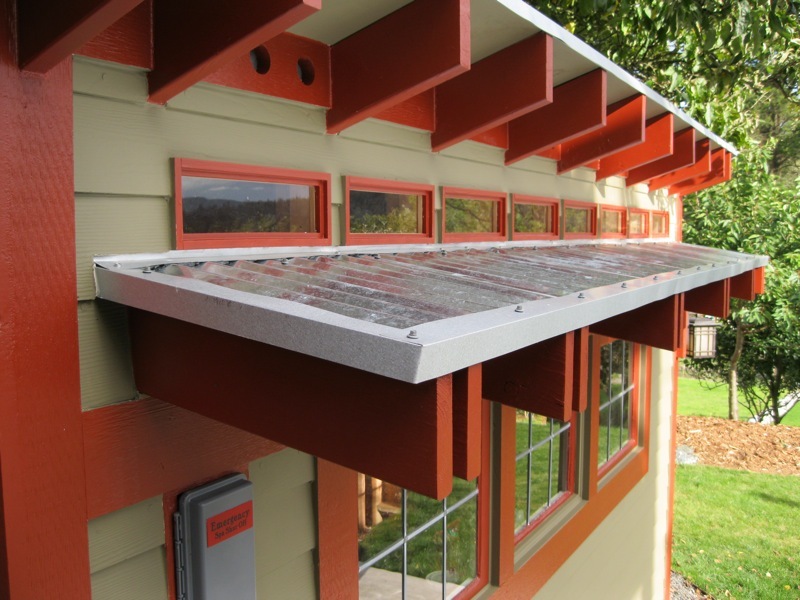 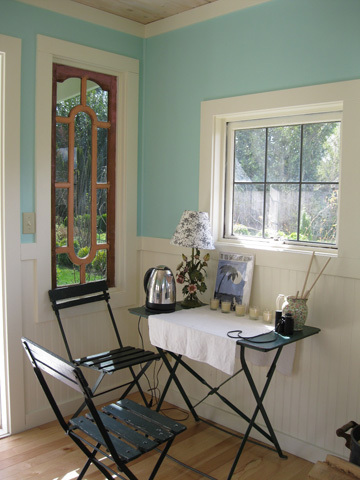 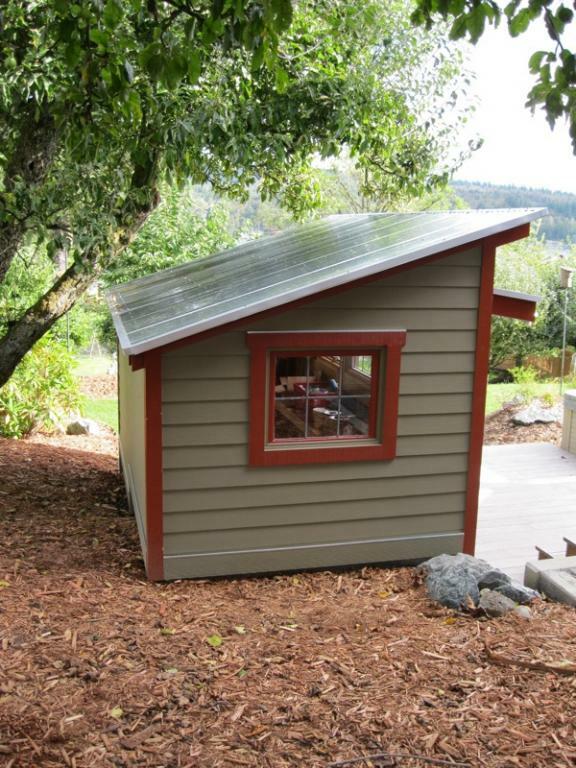 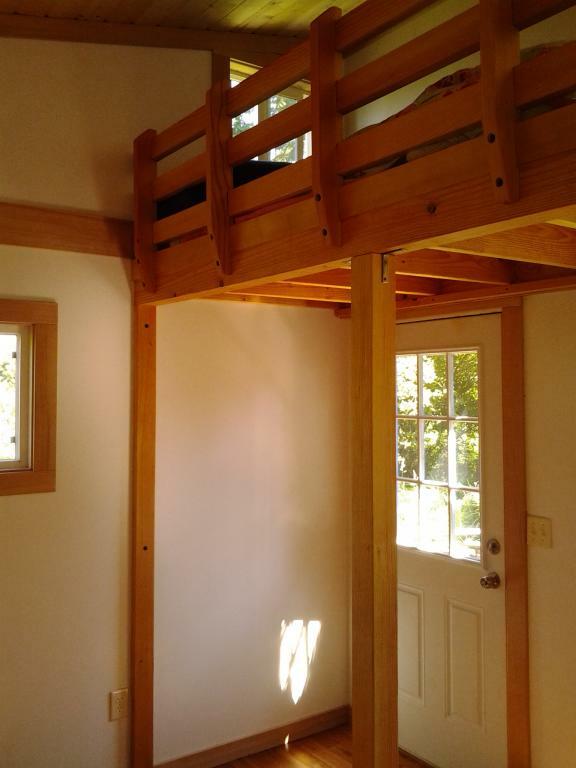 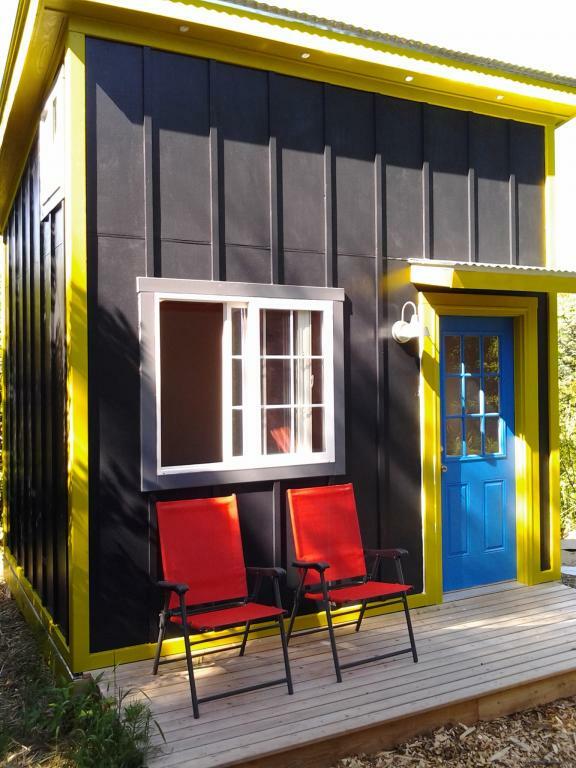 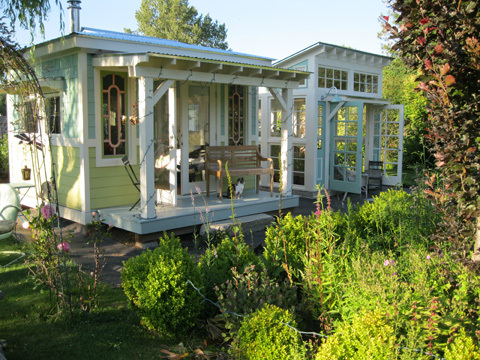 This product is completely non-toxic and made just a few miles north of the border on Salt Spring Island, BC. 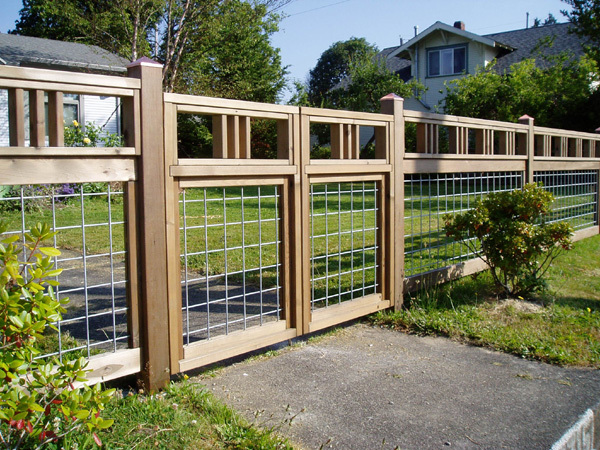 Fences can present an opportunity to do something unique and creative. 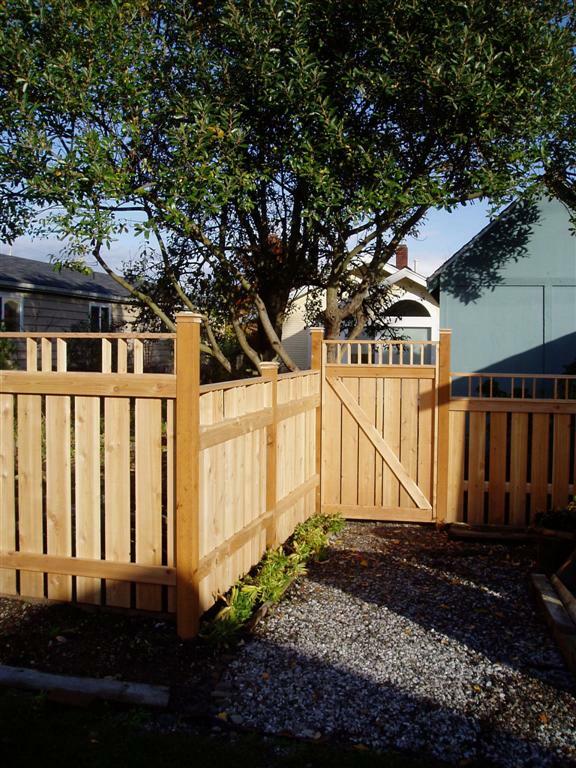 It seems most fences are constructed strictly as a border or barrier to a property with little thought for design. 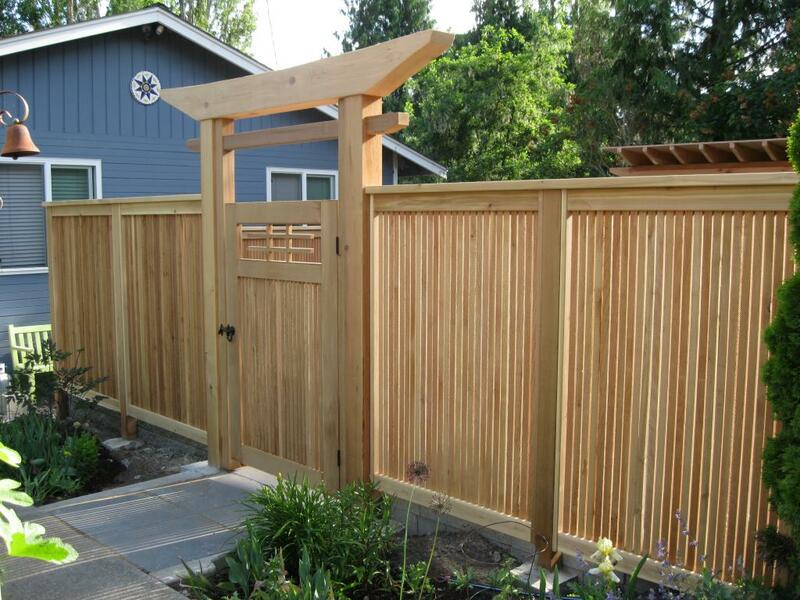 Our client here wanted a privacy fence, but not simply a wall of wood. 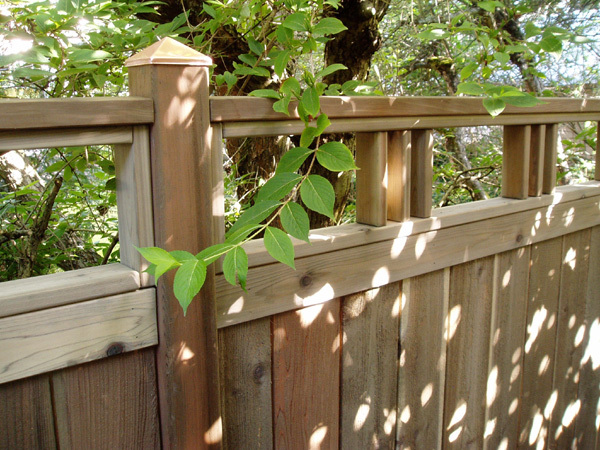 We ultimately came up with a panel comprised of willow twigs to accent the top of each section. 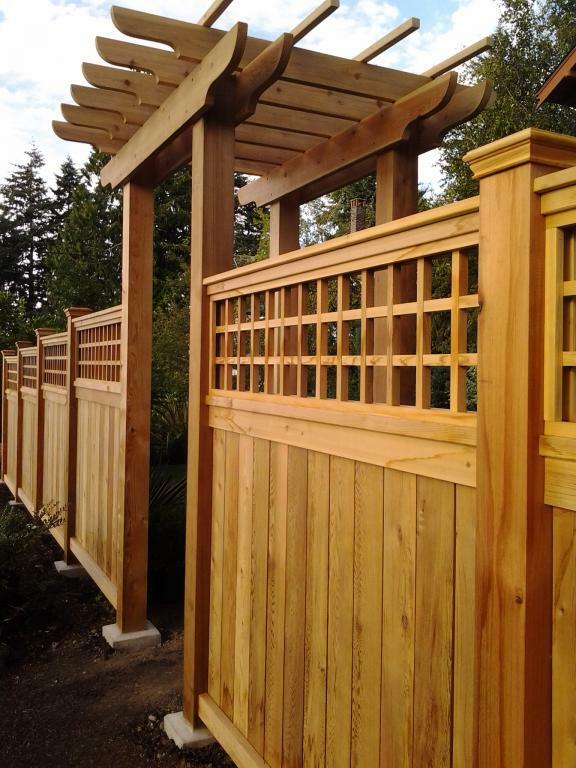 The willow panels coupled with accent banding break up the "wall" effect and add an organic, natural quality to the fence. 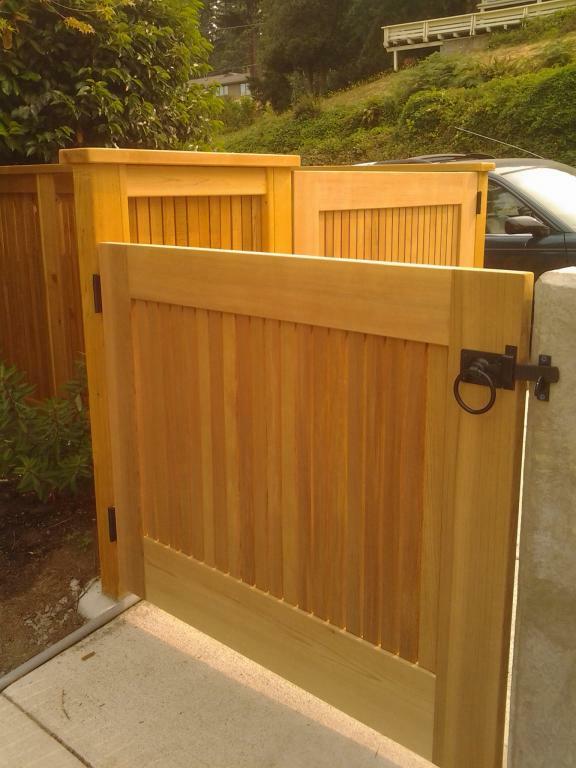 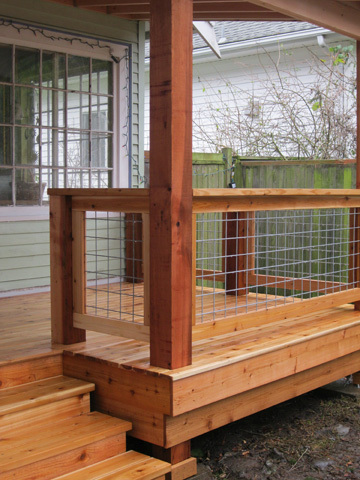 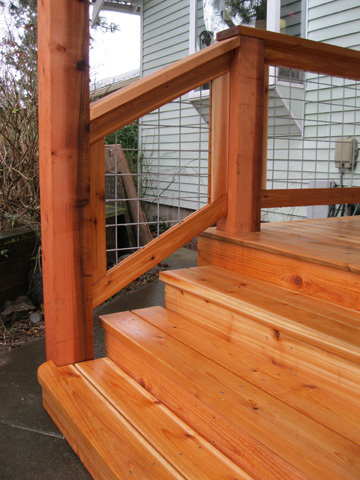 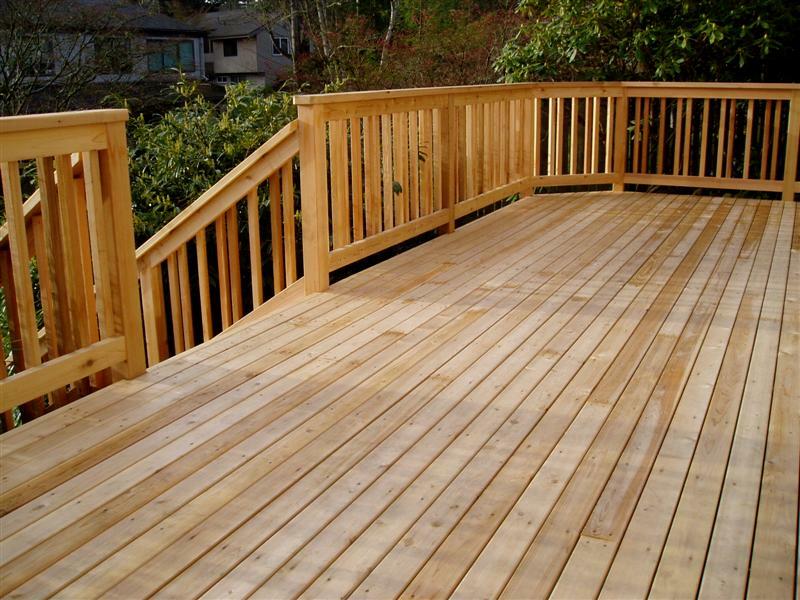 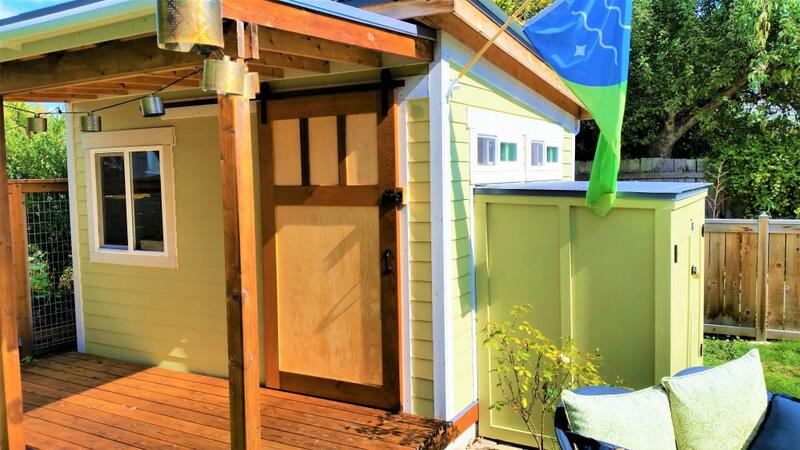 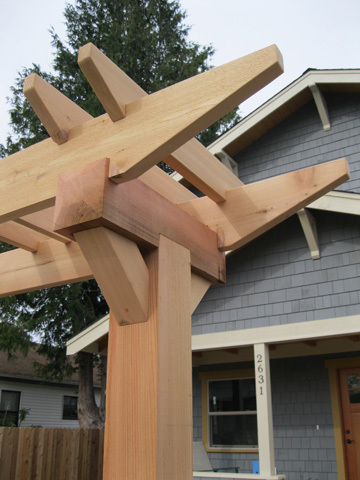 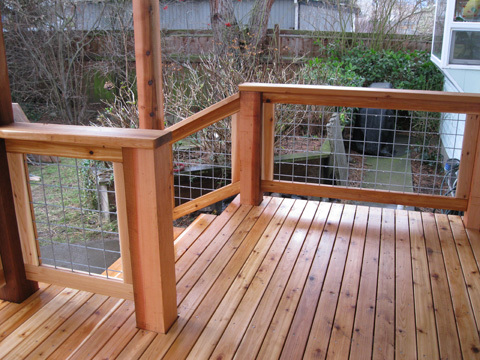 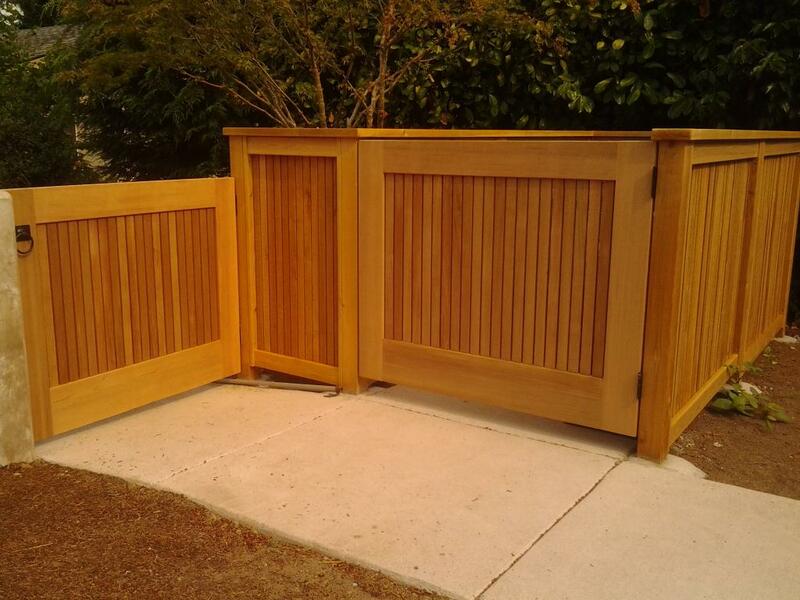 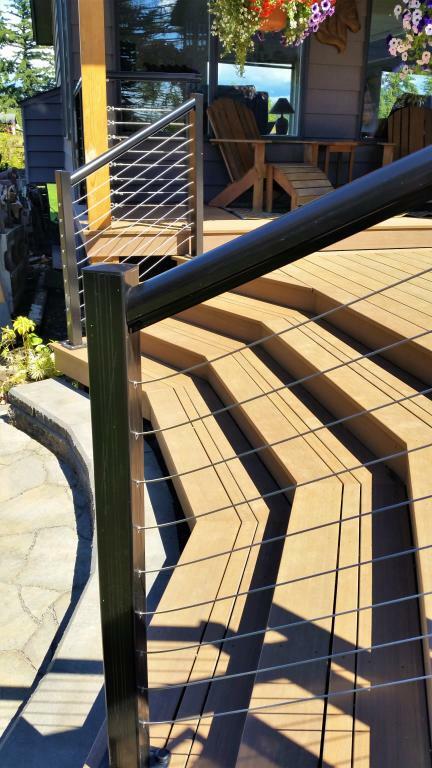 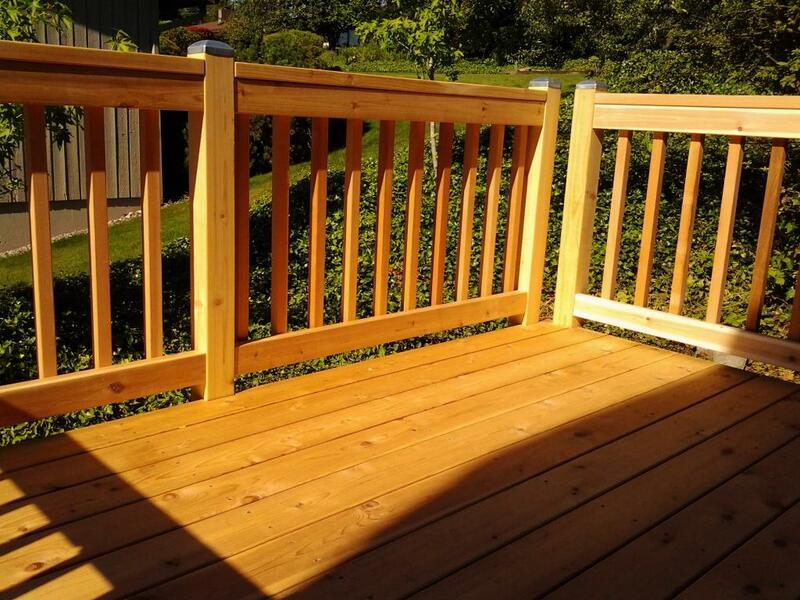 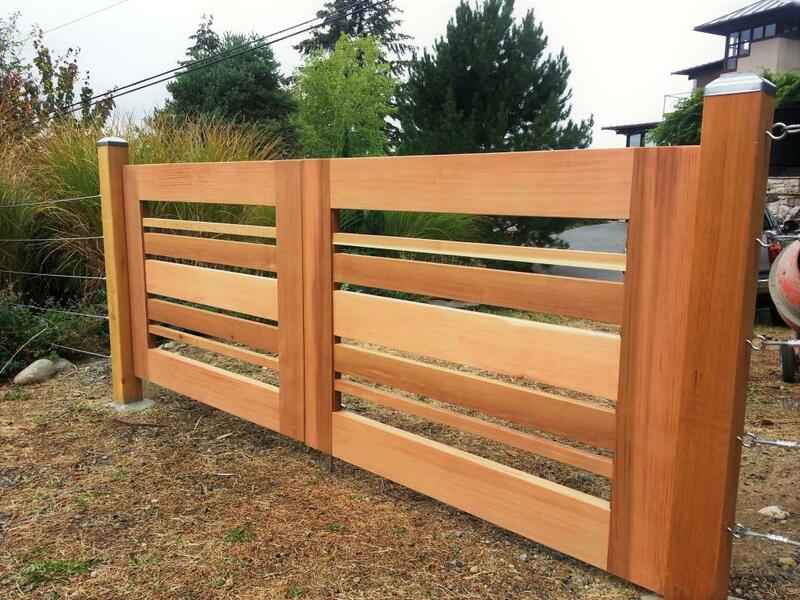 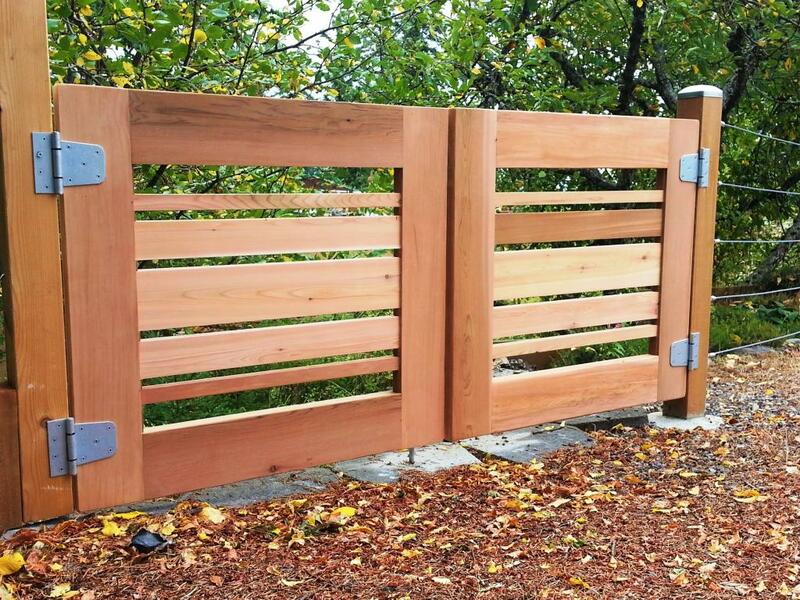 The fence boards for this project were milled locally from a tree that actually came from Whatcom County. 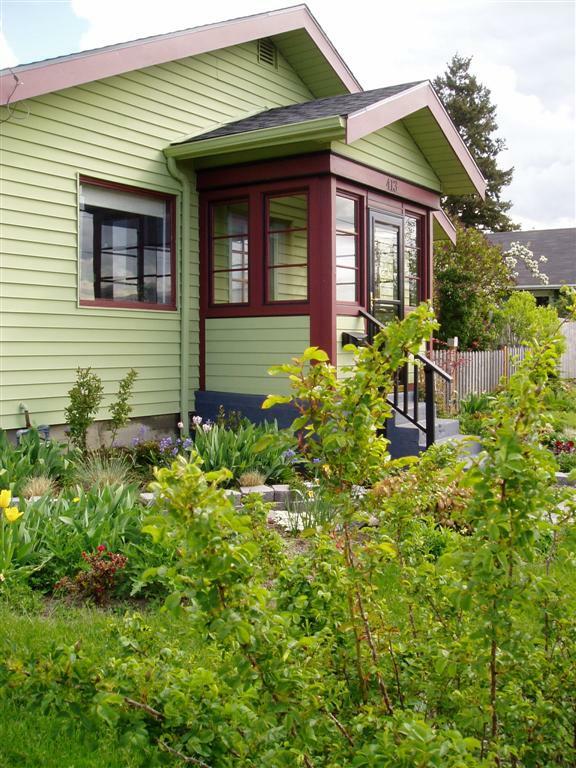 We aren't always able to find such completely local resources, but we try. 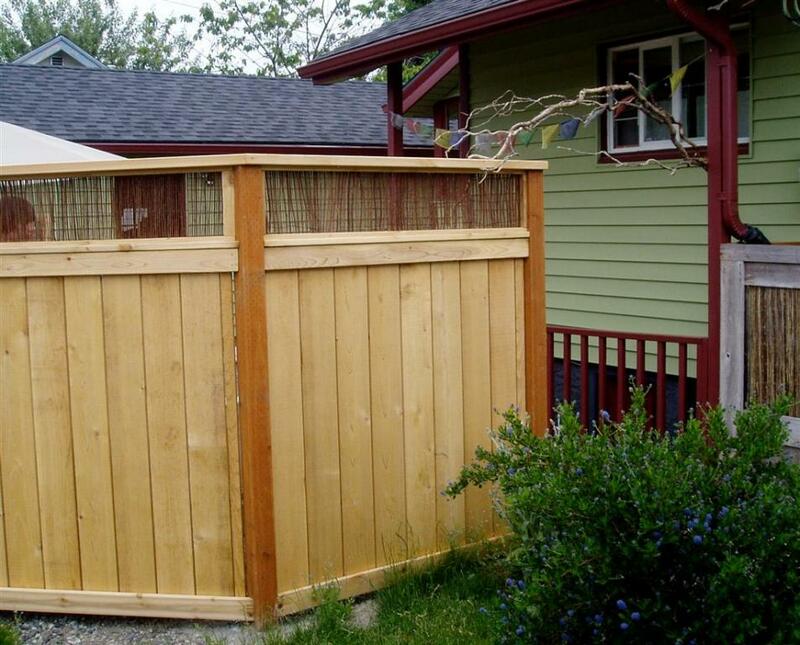 Sometimes a fence is required not so much for full walled-in privacy, but more as a subtle screen and deterrent to critters. 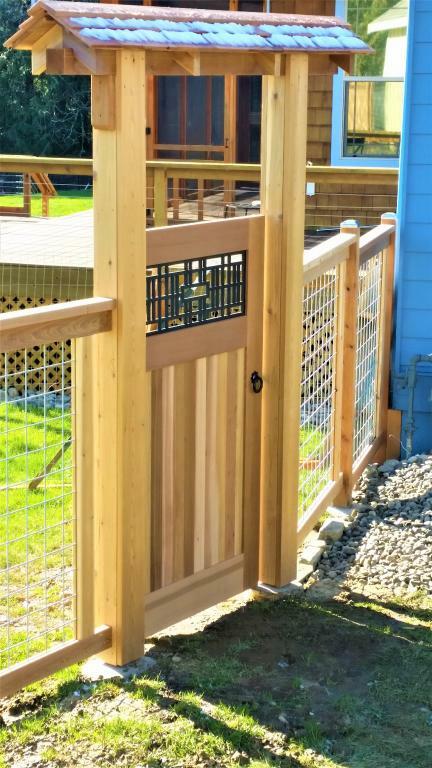 This client wanted a fence that would screen certain views from the house, but still allow light into the garden and not appear a barrier to comradery with her neighbors. 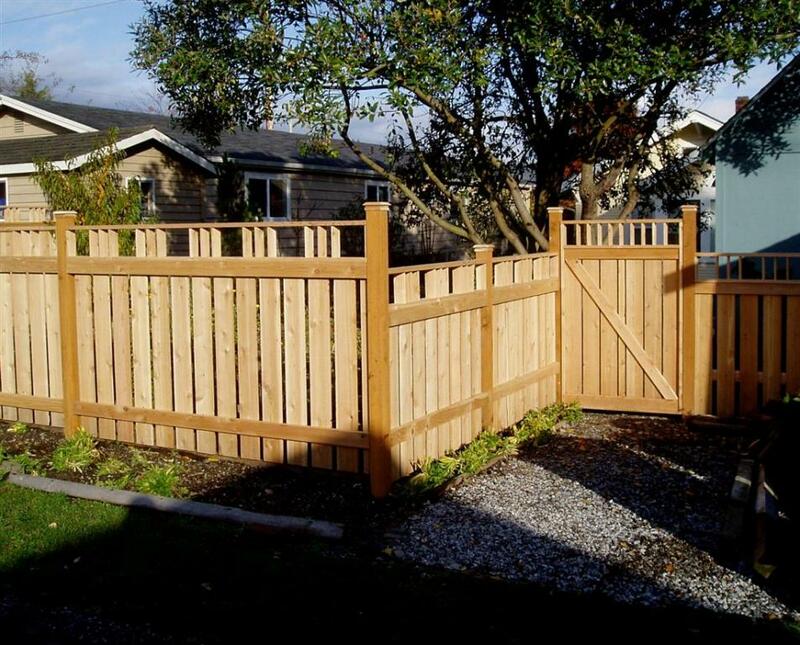 We worked very closely with the homeowner to get the right combination of criteria in place and add a little style to the fence as well. 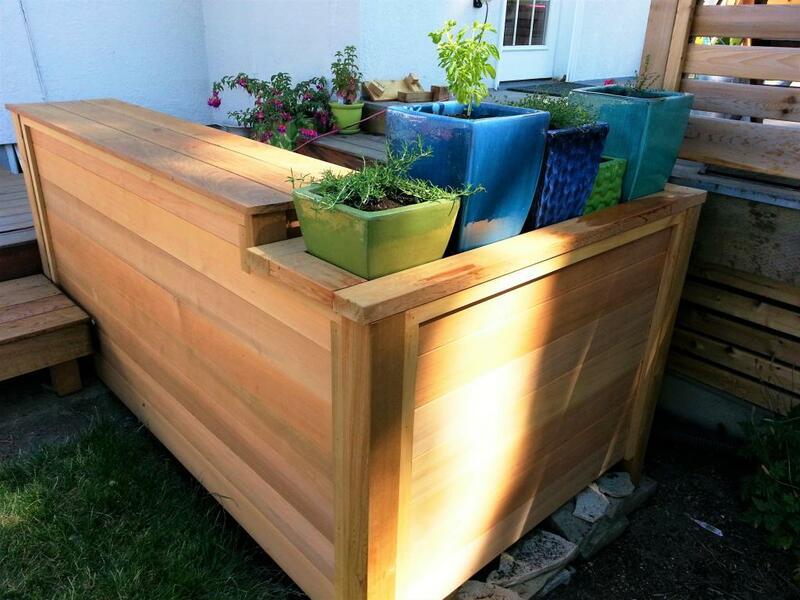 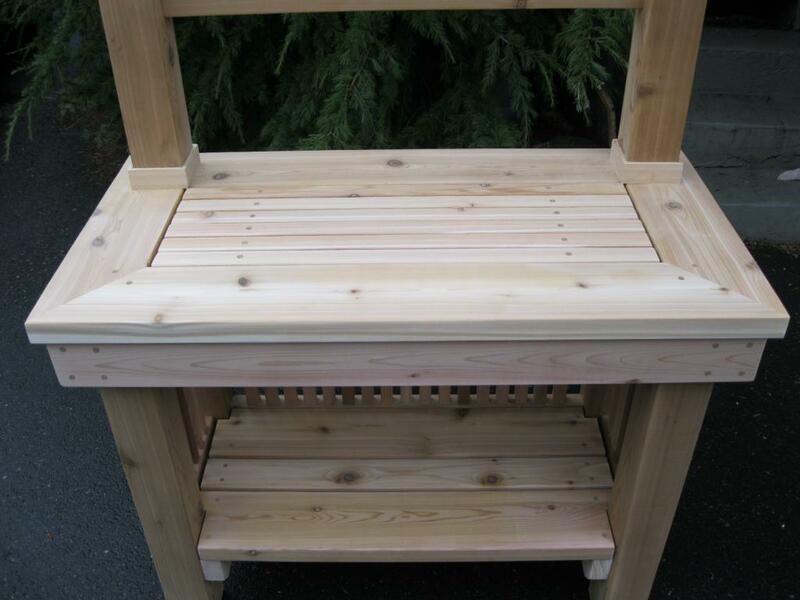 The wood here is indigenous western red cedar and all scraps of useable size were given to a local maker of planter boxes. 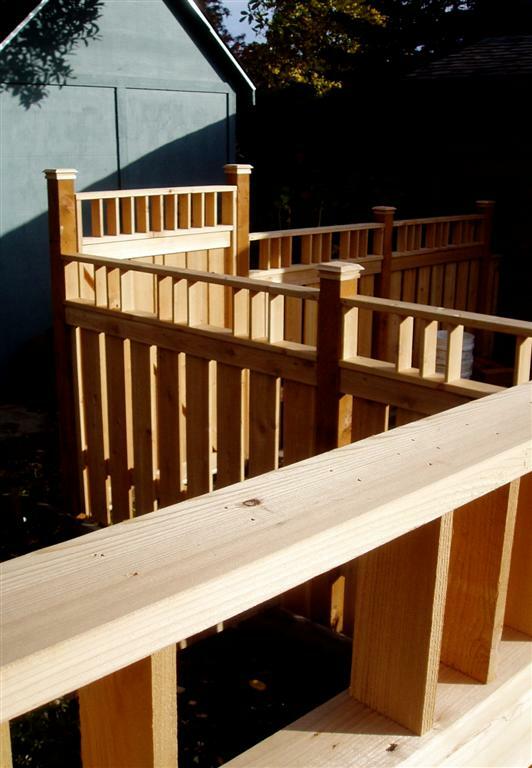 Our goal is always to send the bare minimum of material to the landfill upon completion of a job.